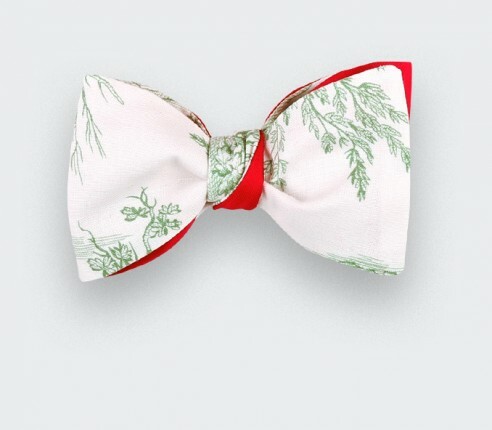 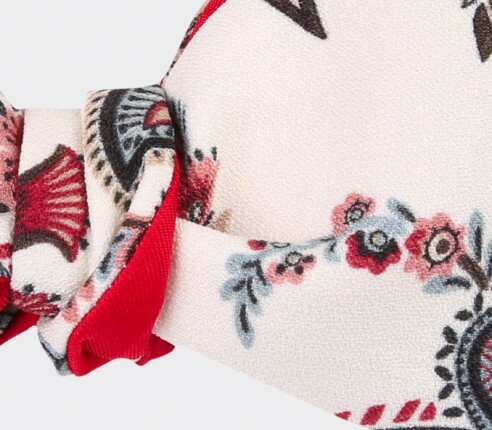 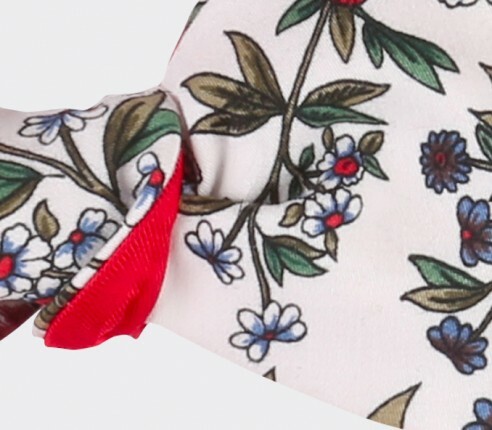 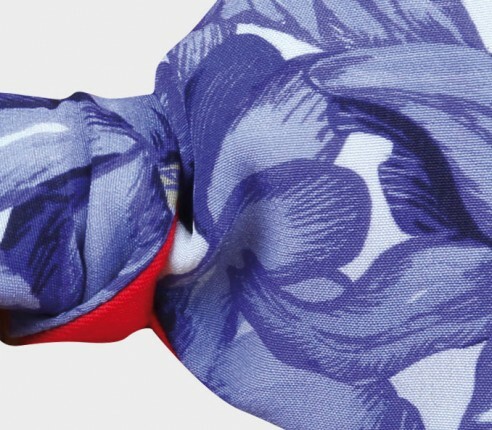 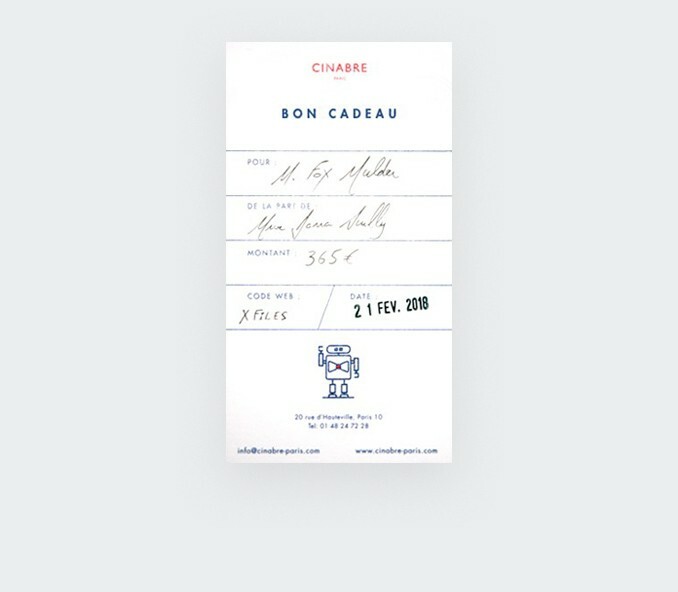 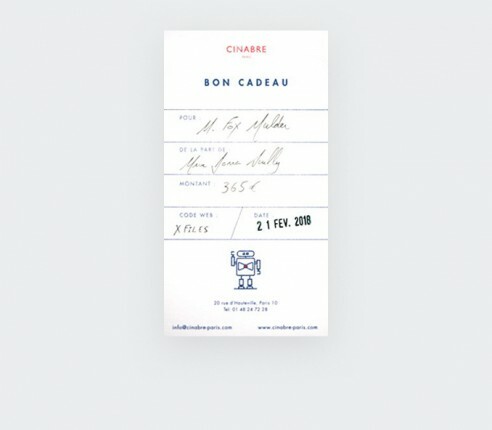 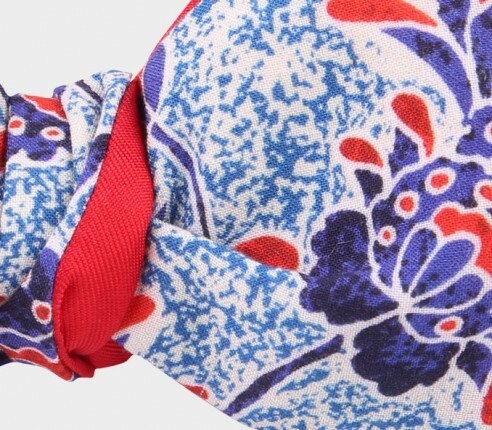 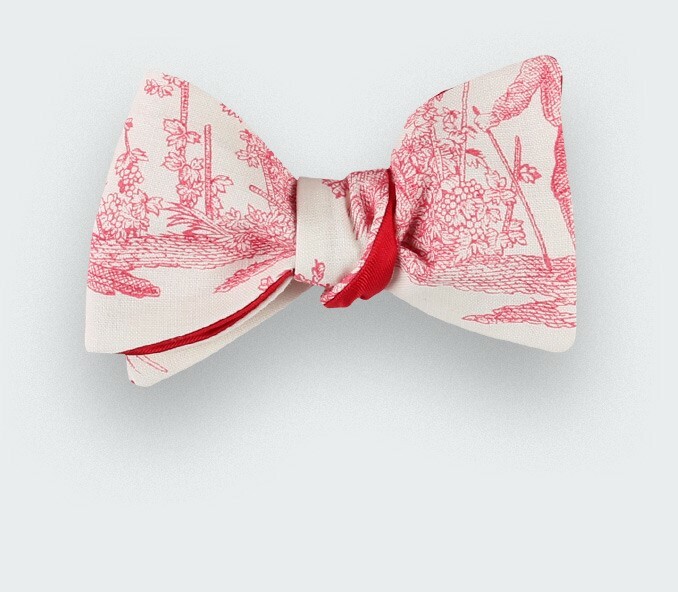 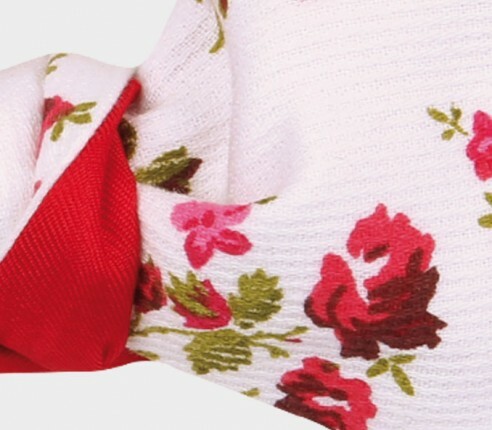 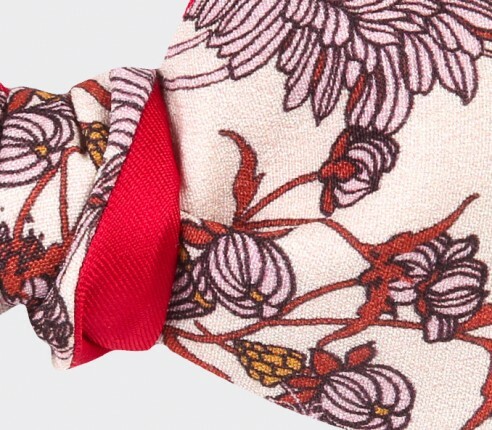 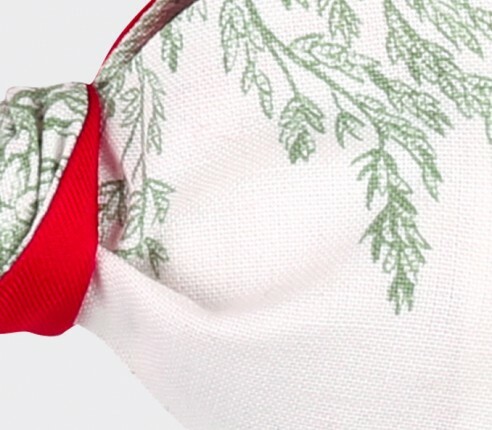 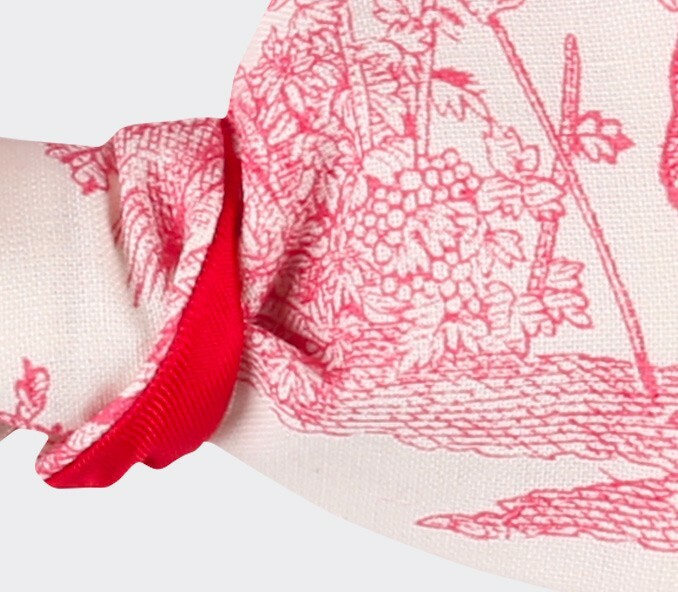 Cinabre collaborated with the authentic French Toile de Jouy to create a unique collection of bow ties. 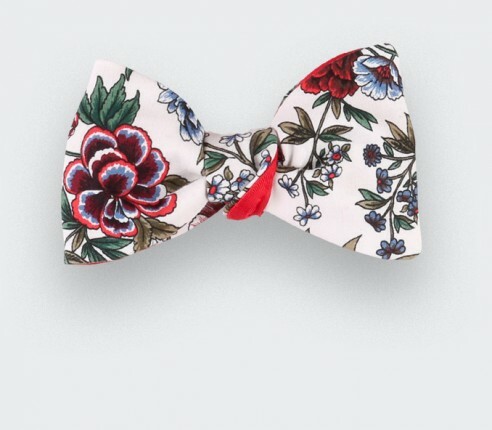 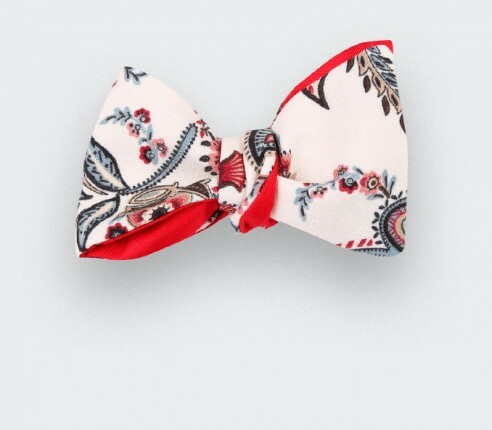 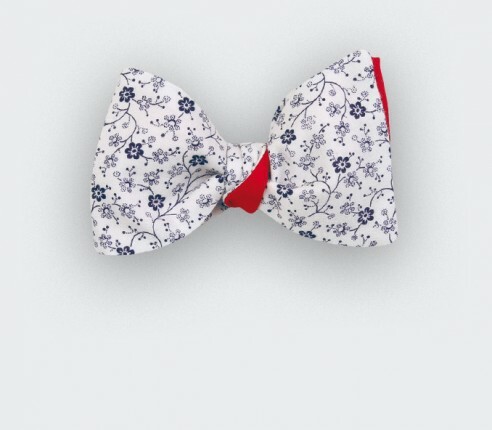 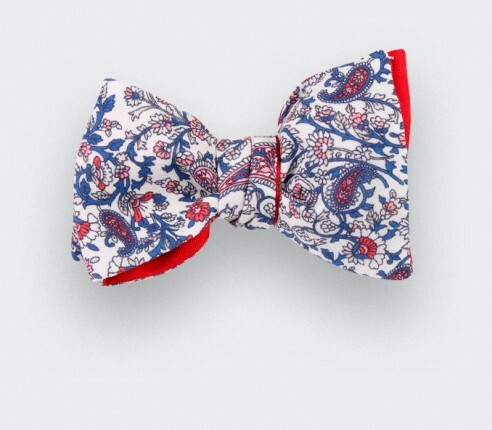 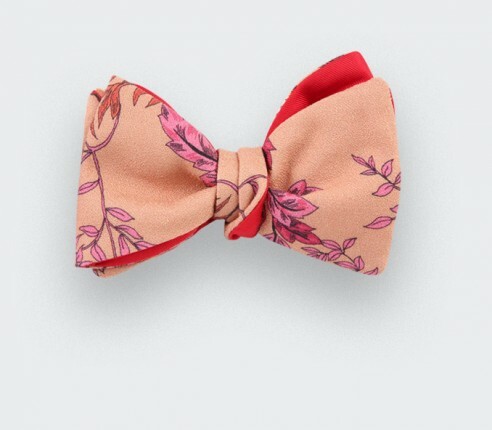 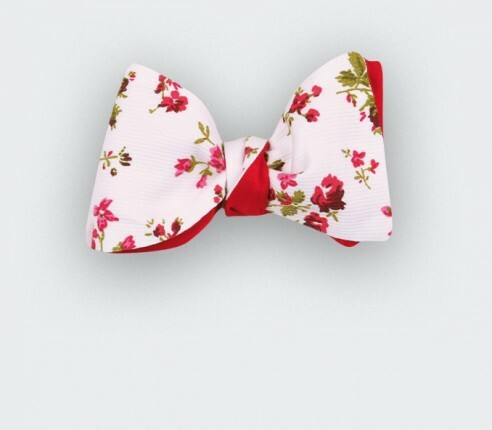 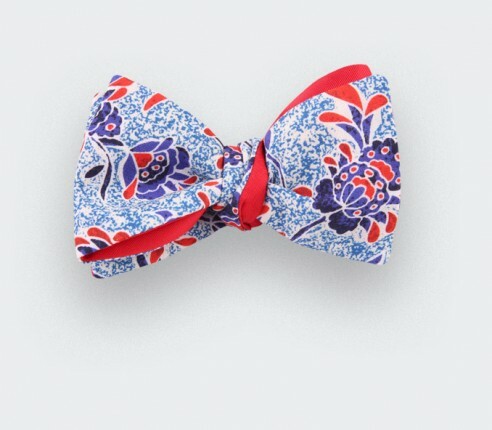 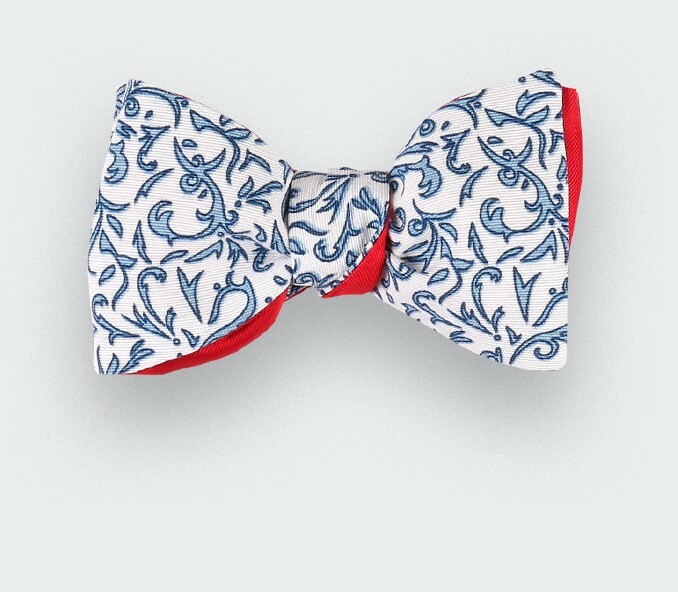 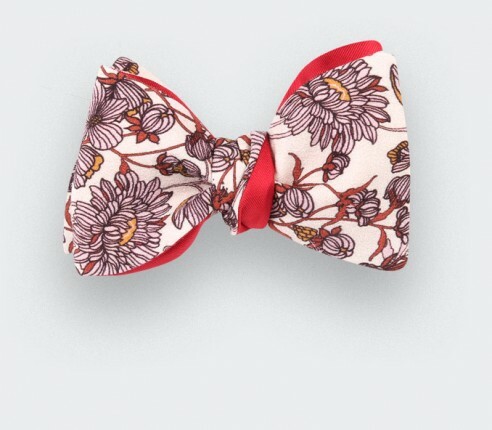 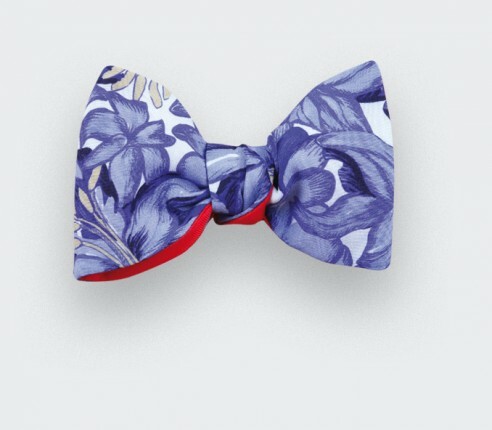 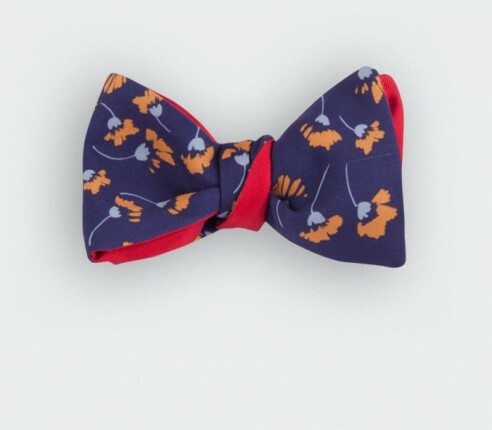 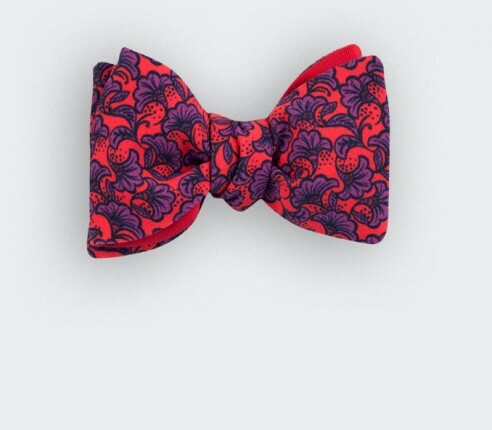 Collection of unique flower bow ties, a must have if you look for new floral patterns. 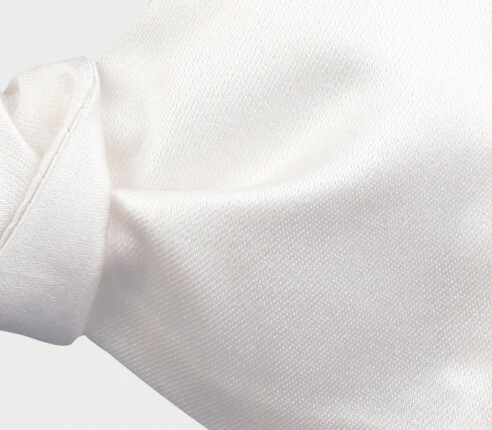 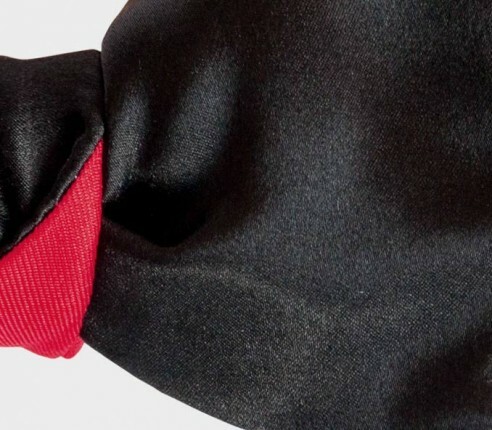 This collection is dedicated to formal cocktails or "black tie" events: from silk satin to velvet, from black to white colours. 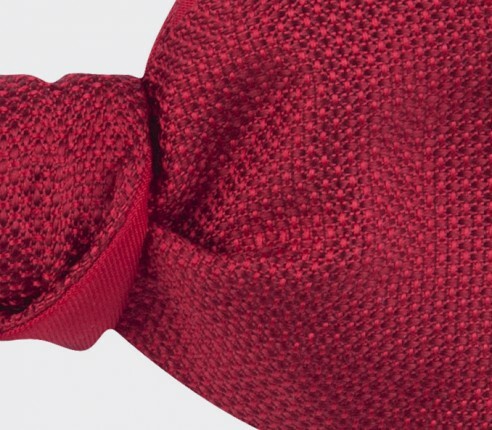 Looks like knit but has the flair of a nice wool, the Maille bow ties are a good compromise for a plain colour design with a small texture. 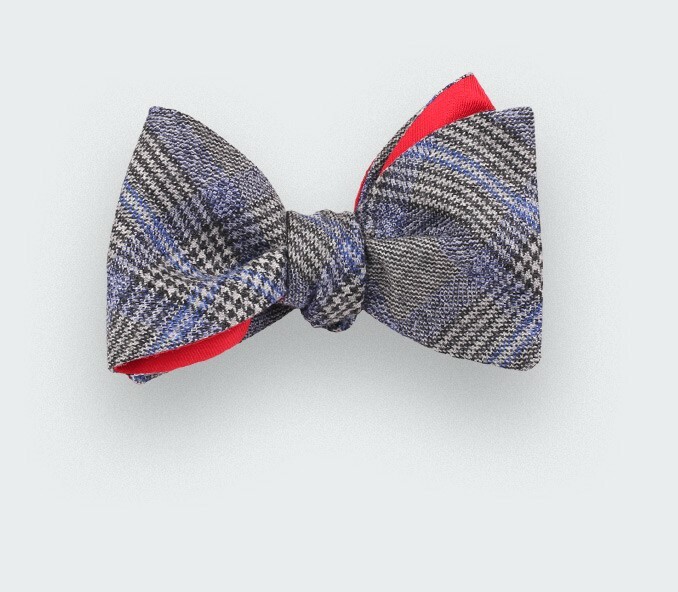 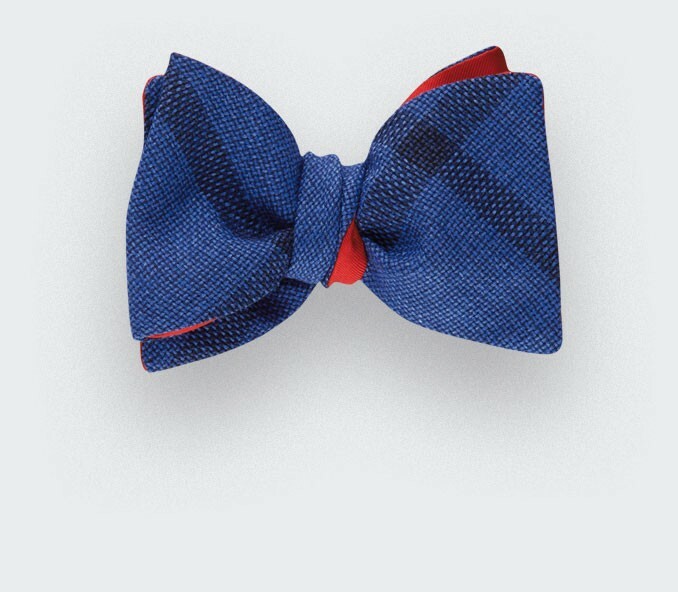 Bow ties collection in super 120’s wool with a glen plaid or Prince of Wales check pattern, blended with a blue spectrum. Collection of bow ties made of soft and delicate English wool. 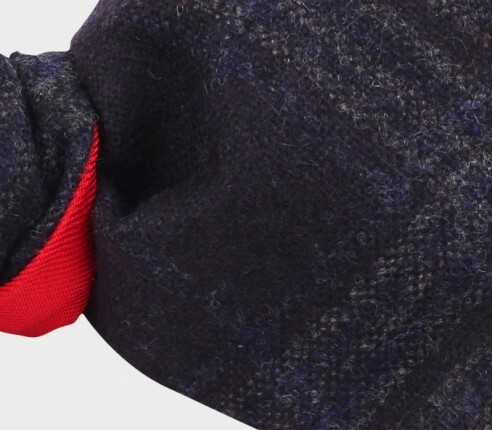 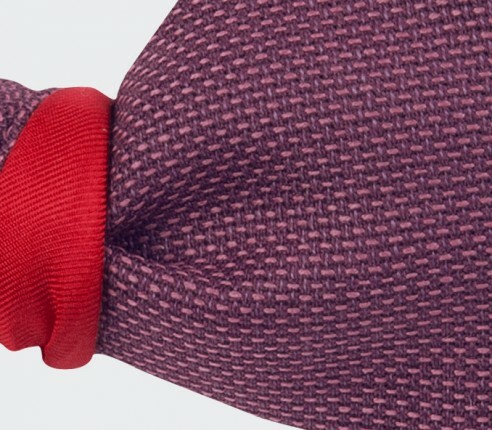 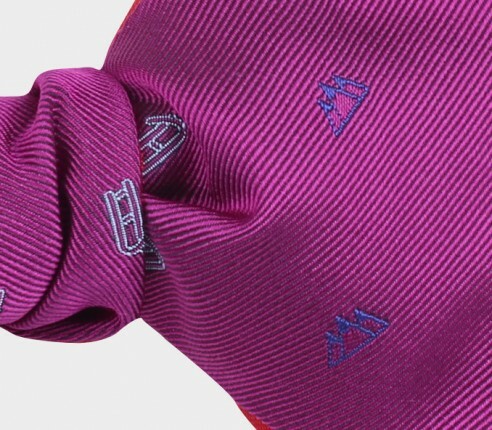 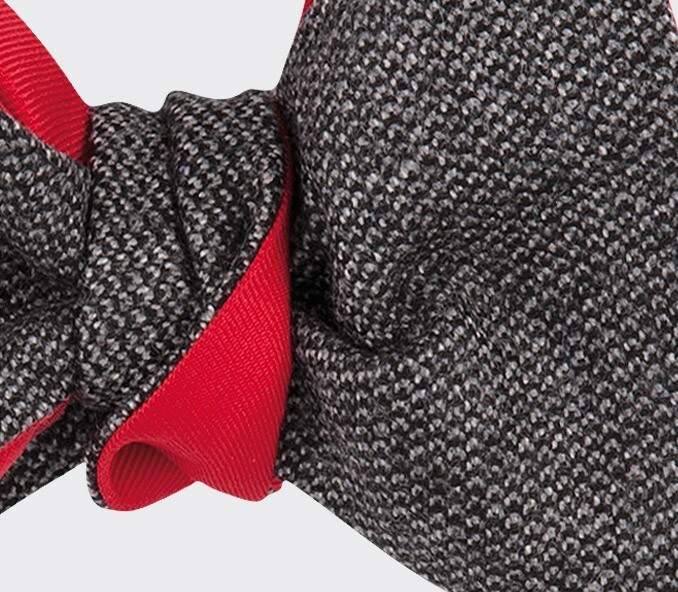 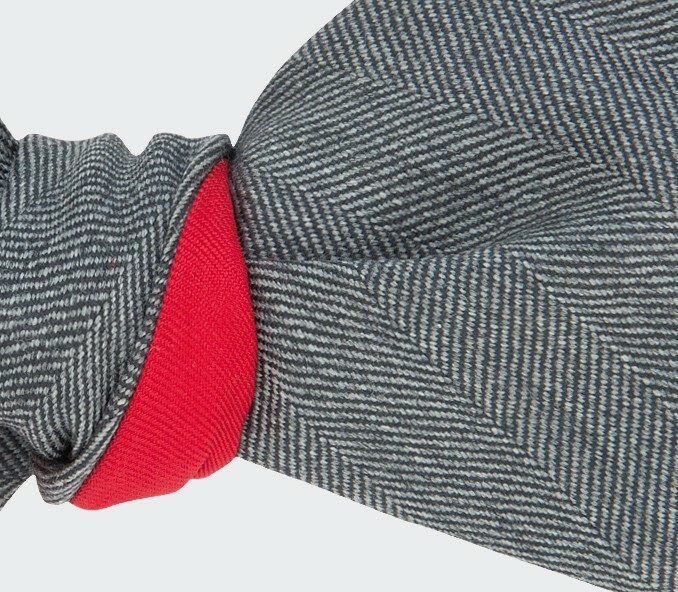 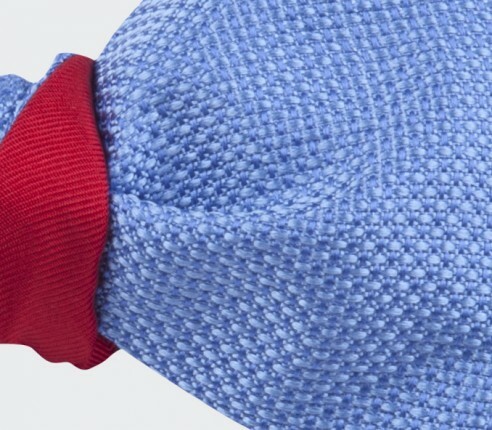 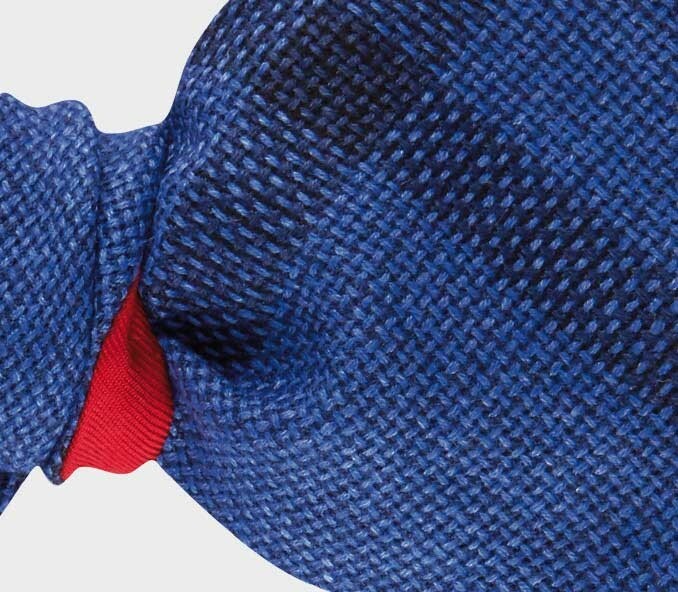 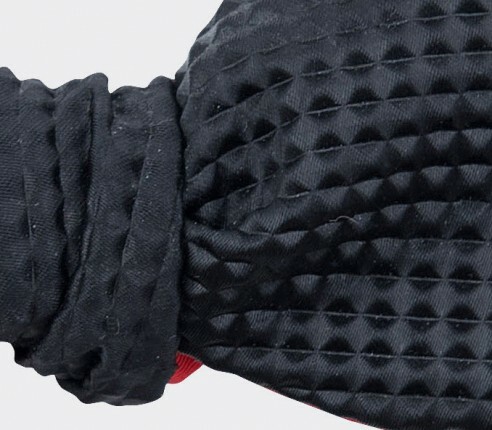 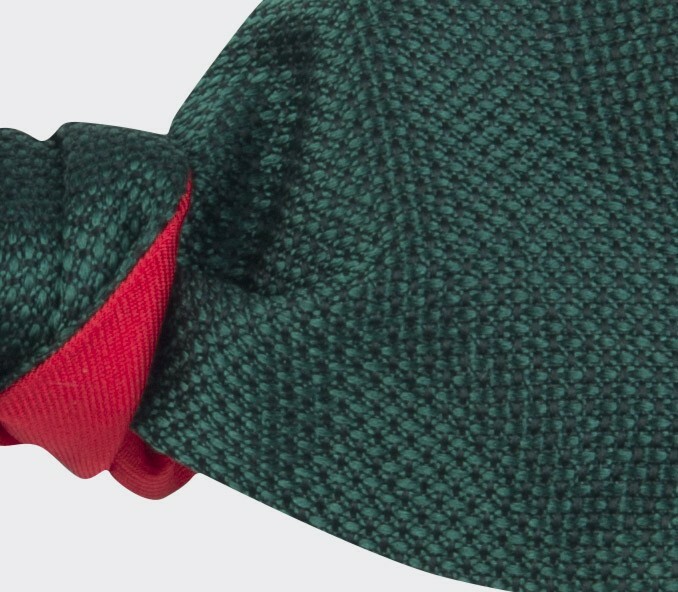 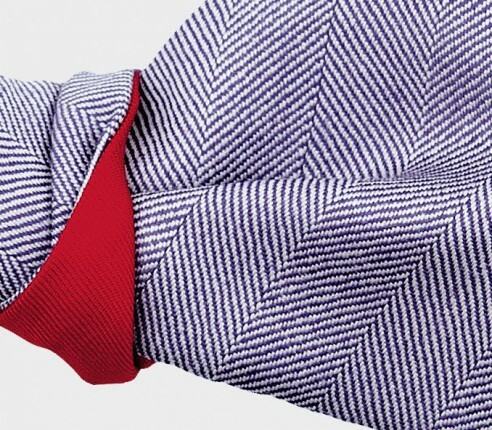 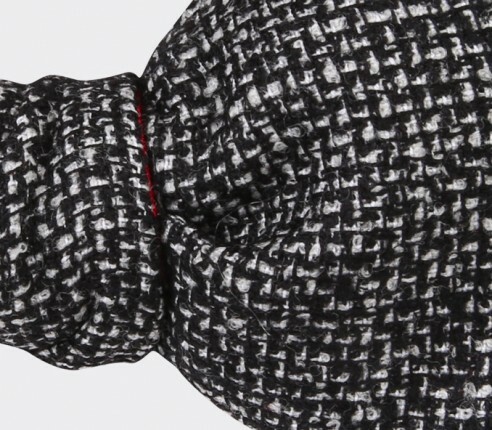 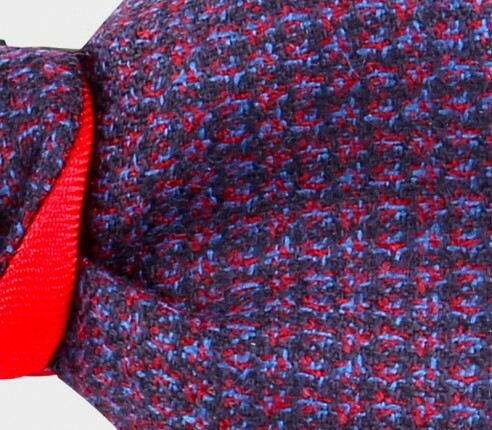 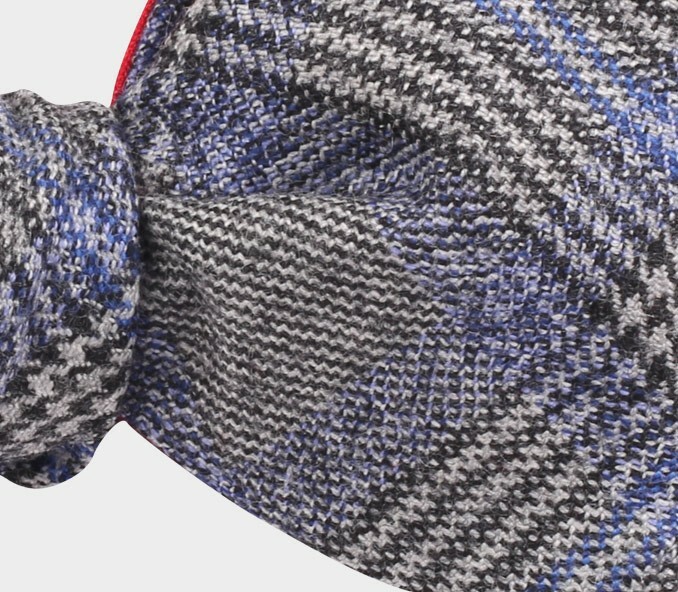 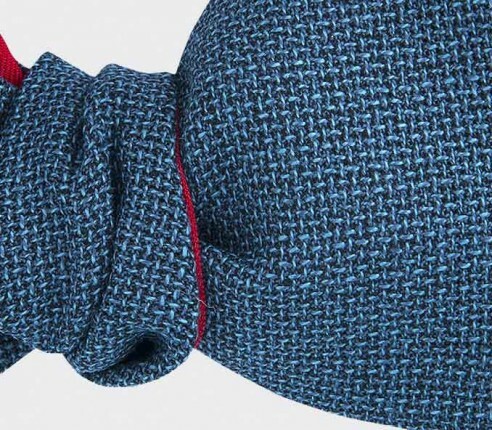 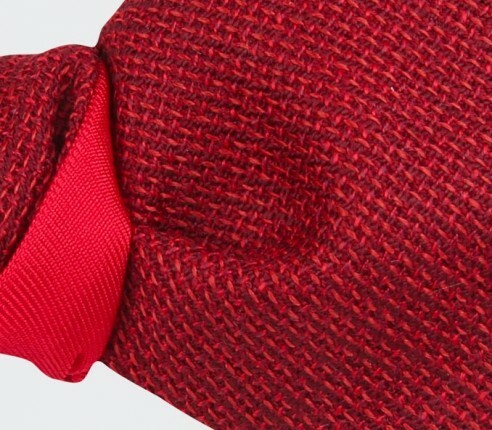 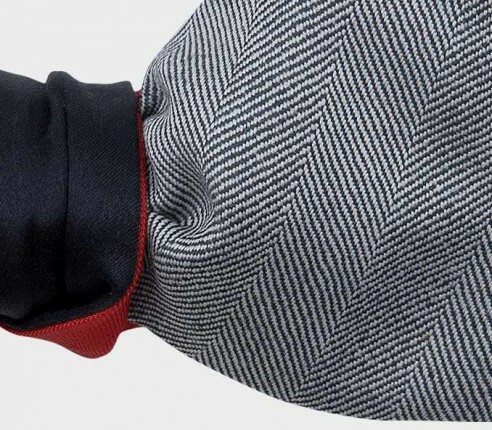 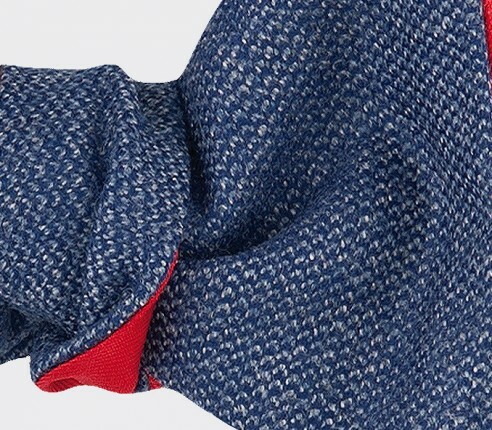 The quality of the herringbone gives the tie a strong and raffiné semi plain colour. 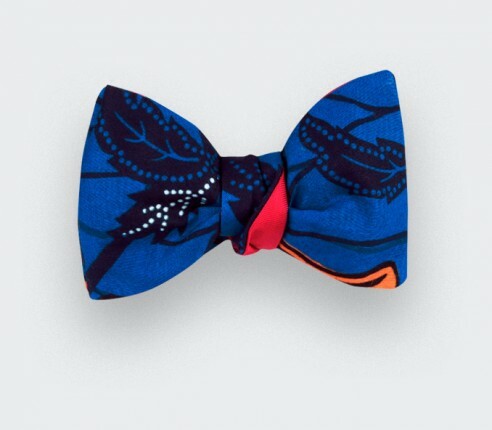 Collection of bow ties made of delicate silk with a birdseye pattern. 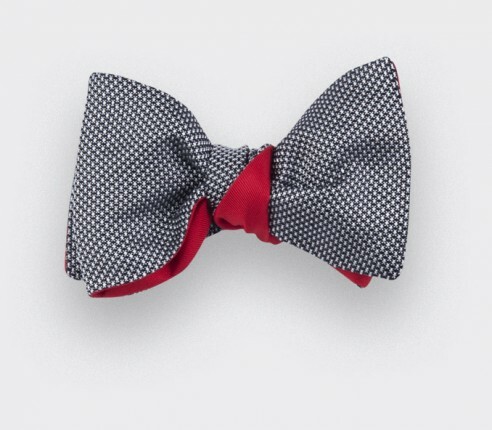 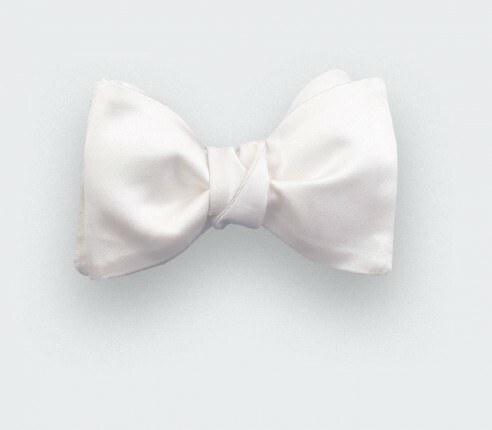 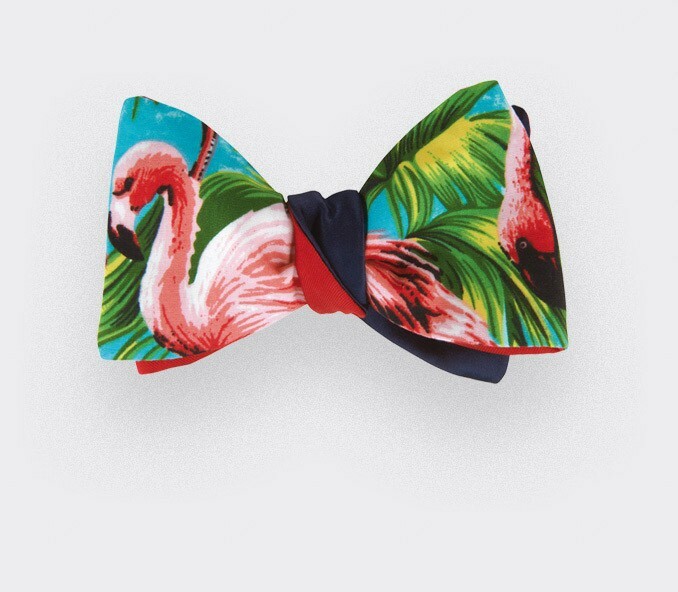 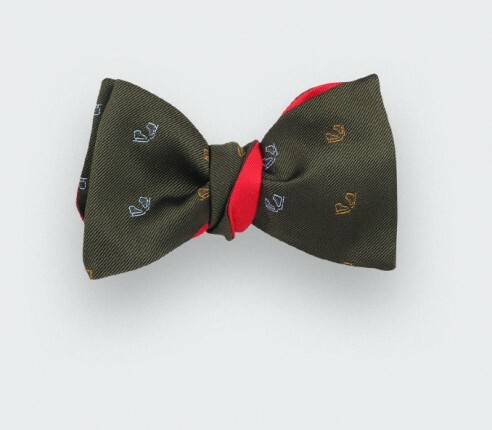 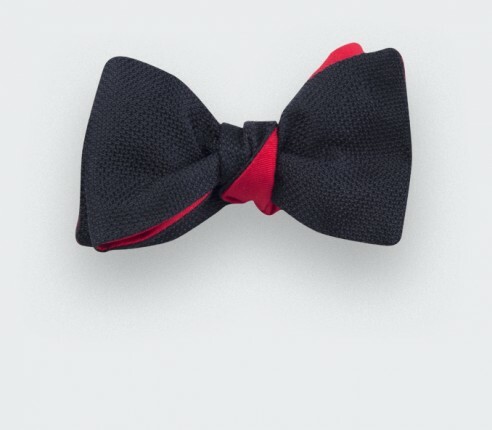 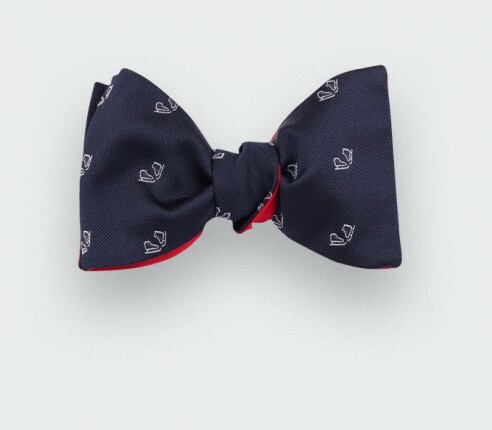 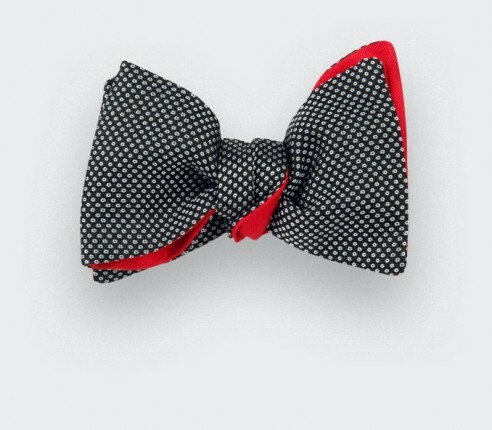 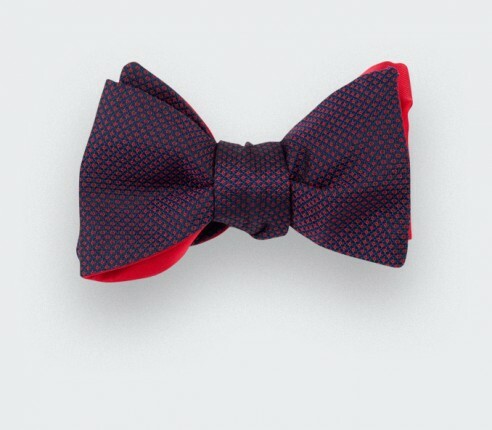 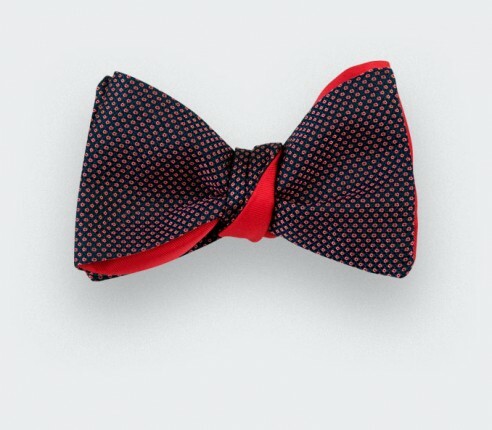 The right choice for a graphic bow tie but still elegant and formal. 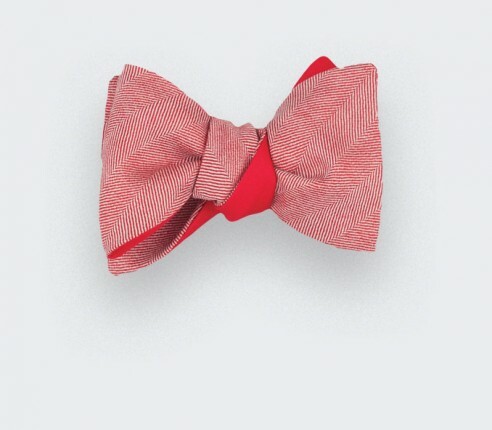 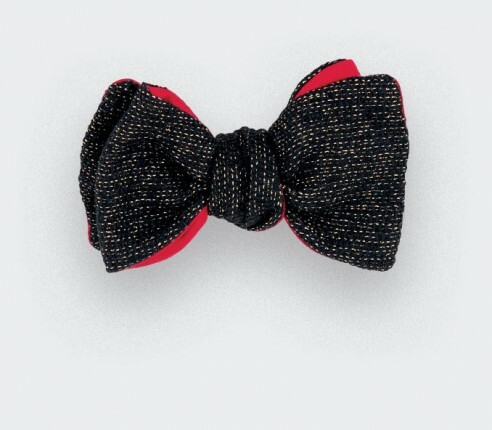 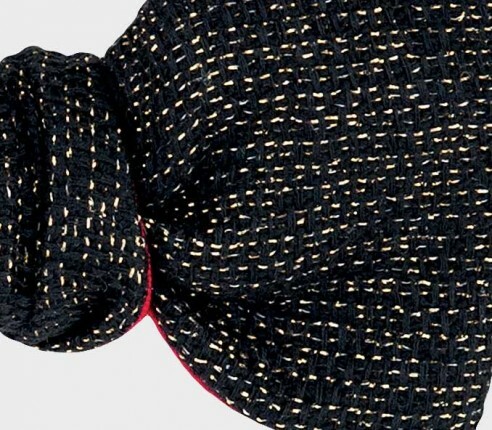 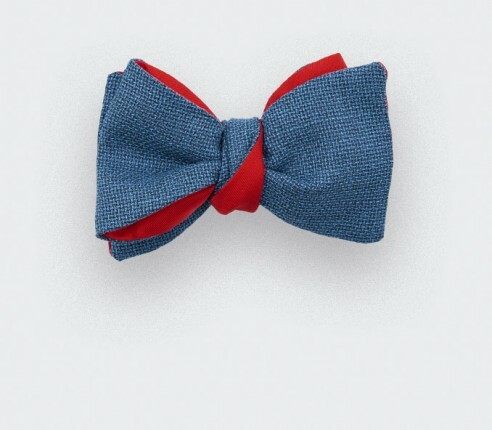 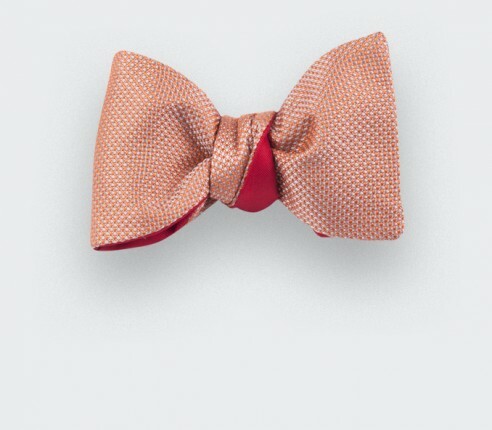 New collection of woven silk bow ties with an extent range of colors. 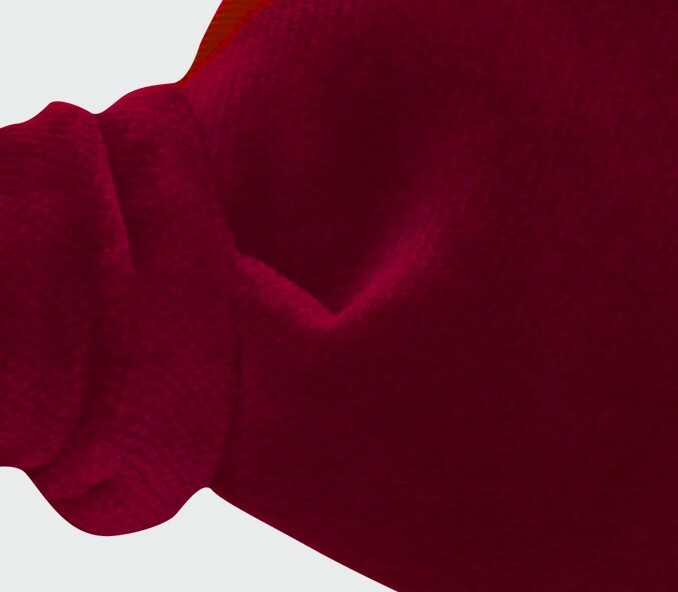 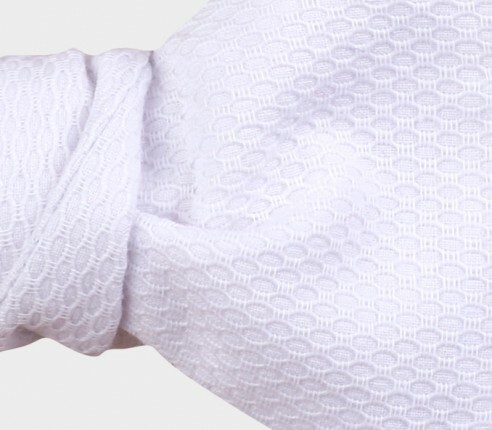 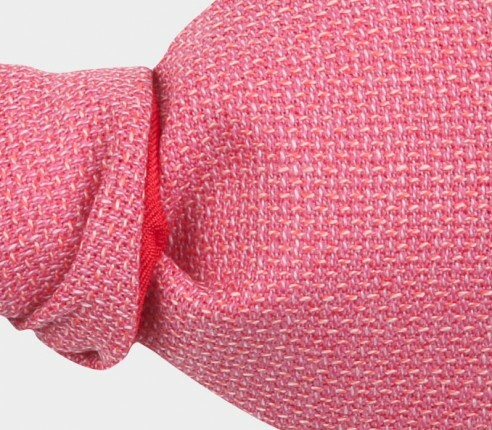 High quality silk with 8 yarns for a better hand and an interesting knitting texture. "2 in 1". 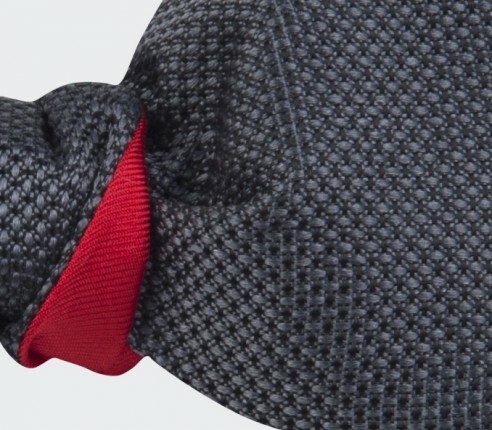 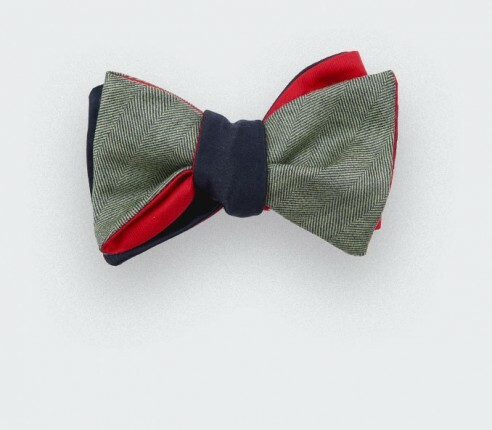 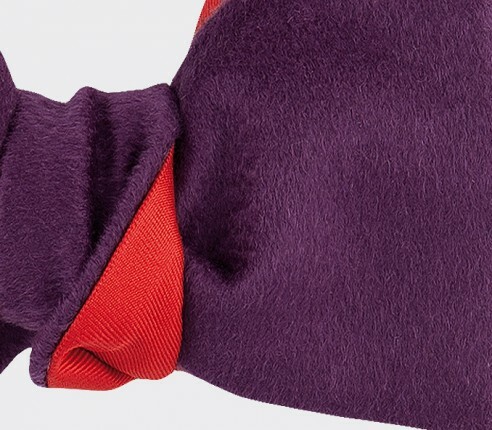 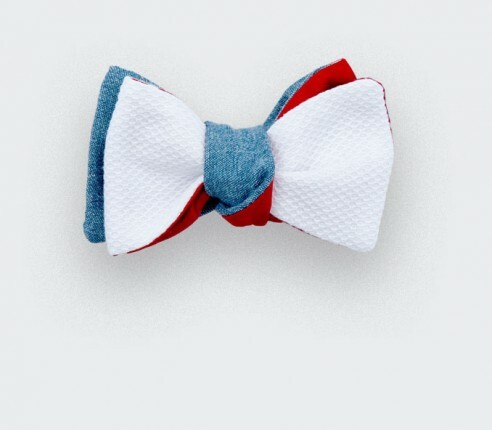 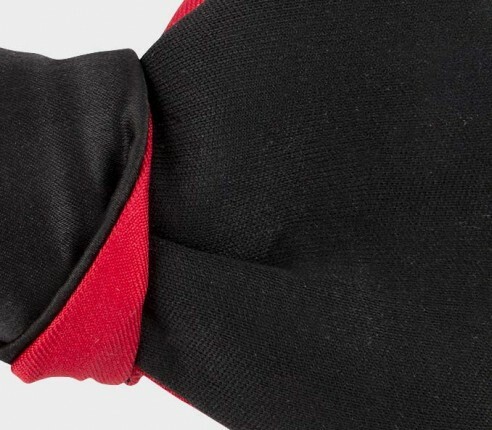 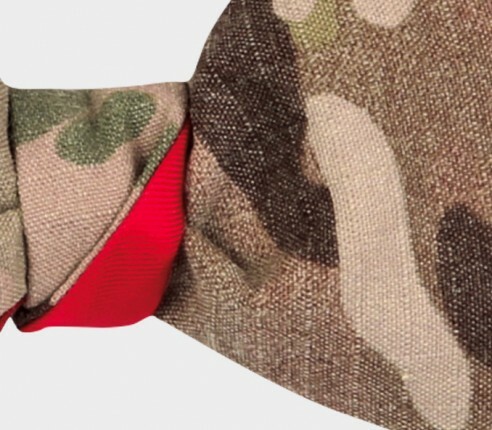 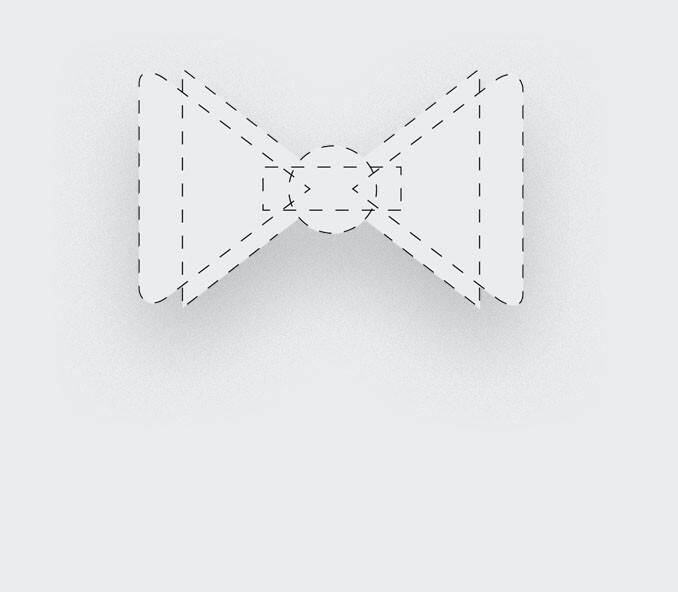 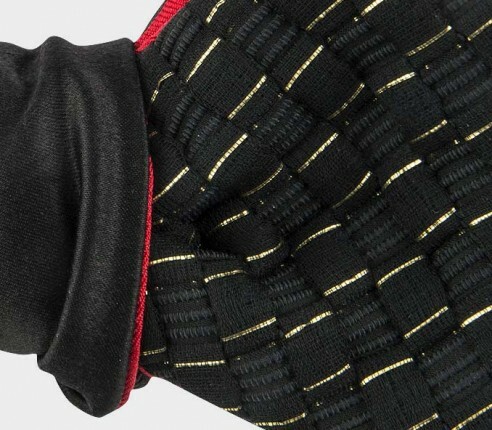 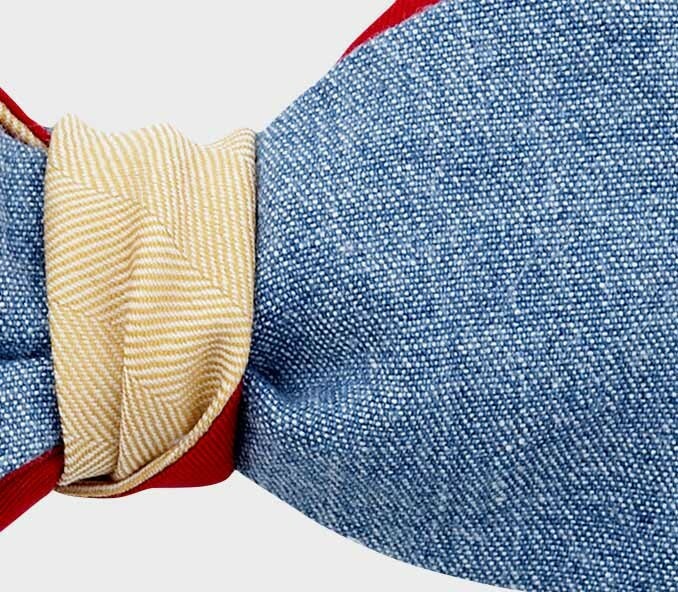 Each bow tie is made with two different fabrics. 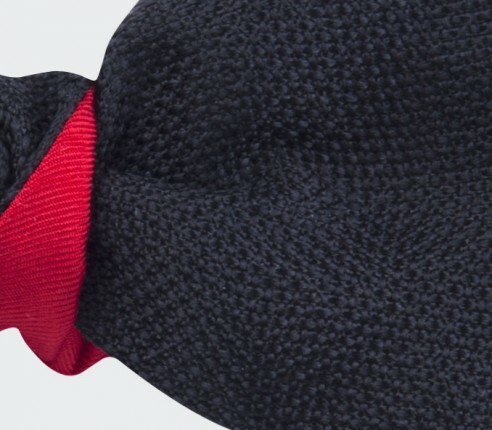 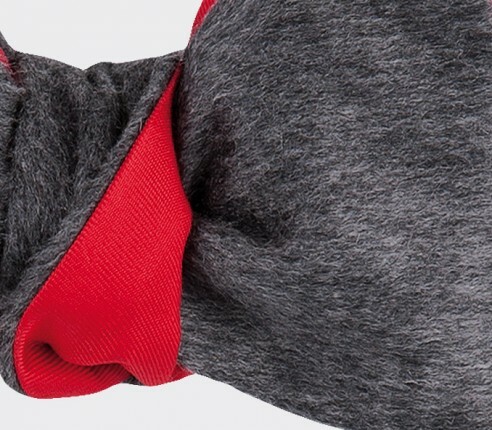 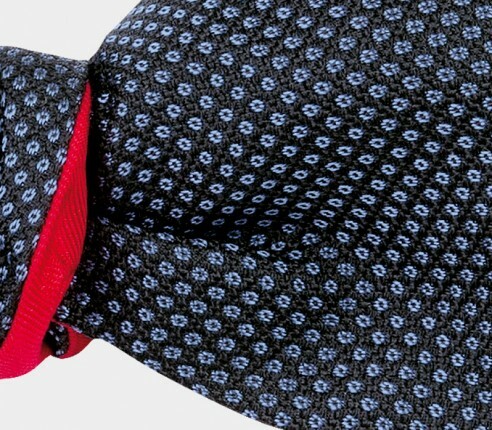 You can change the look of your piece by changing the way you tie it. 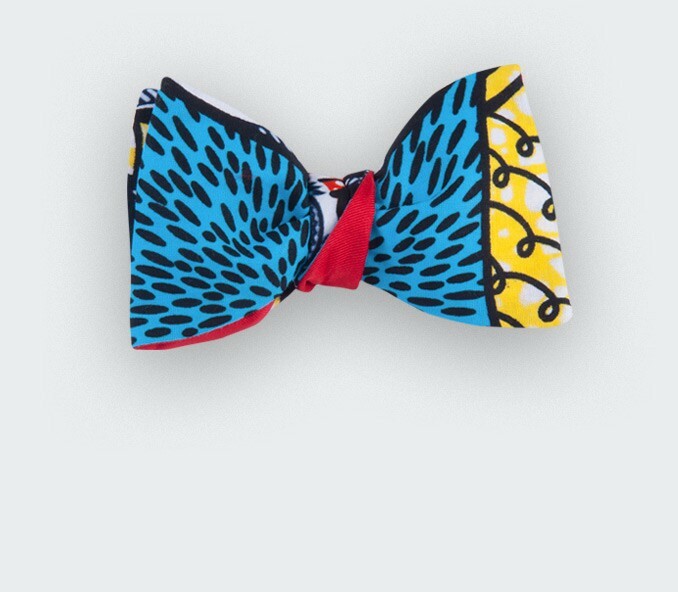 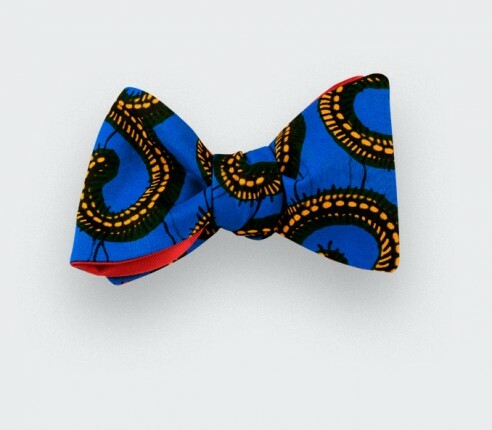 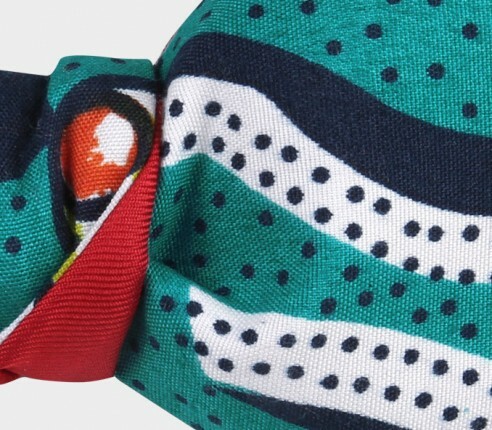 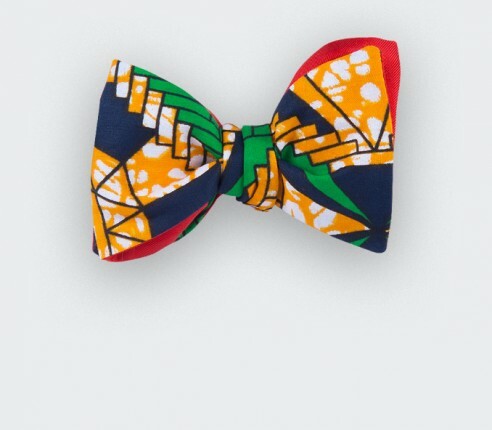 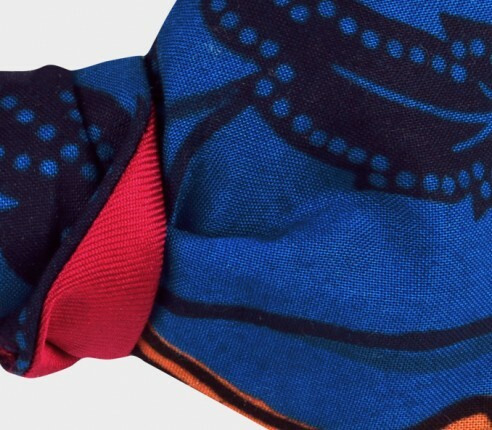 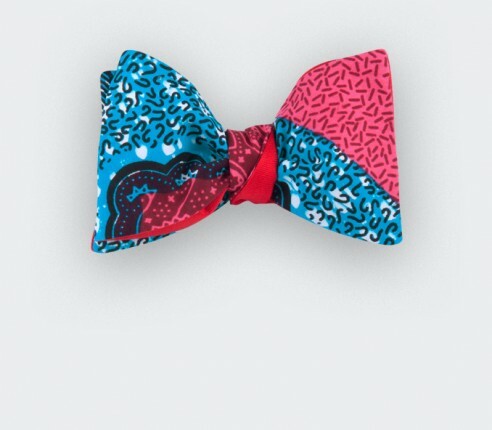 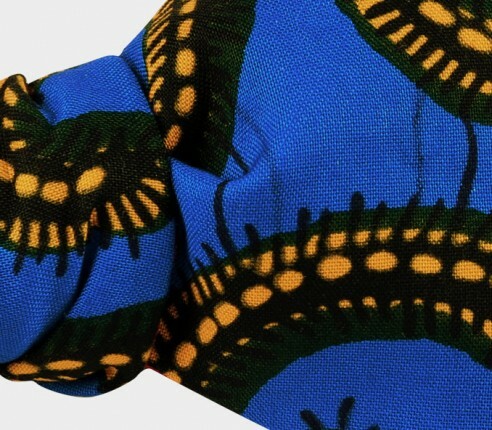 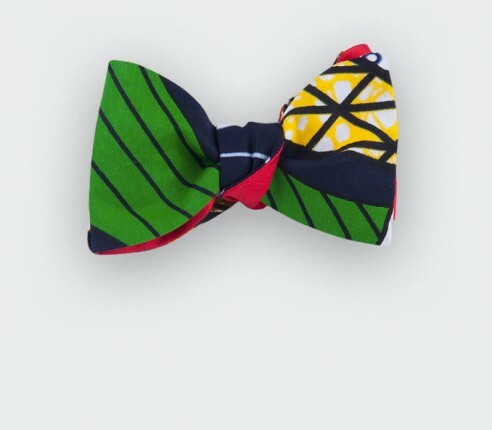 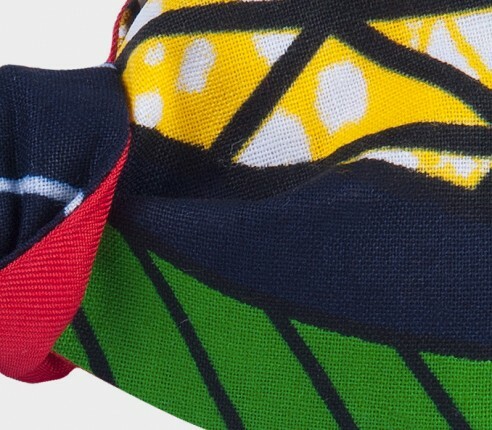 Bow ties made of authentic wax prints fabrics from Africa. 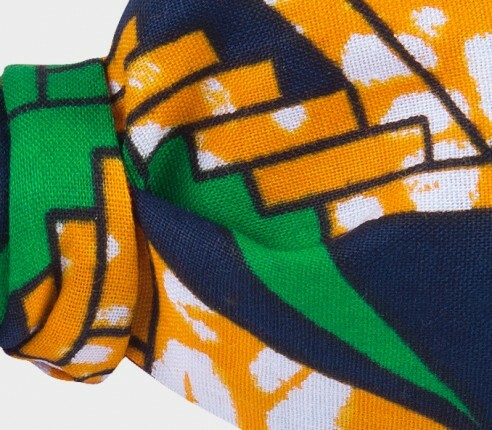 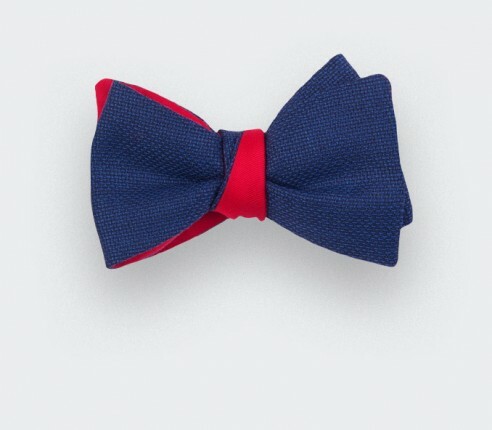 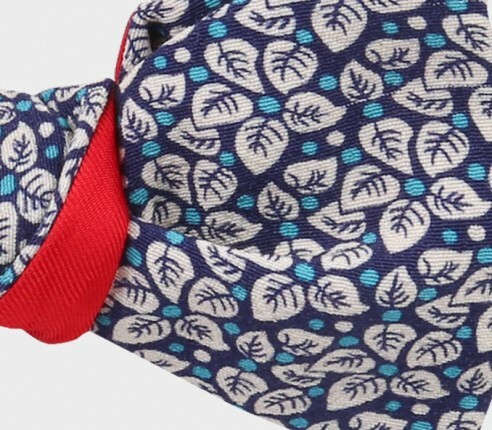 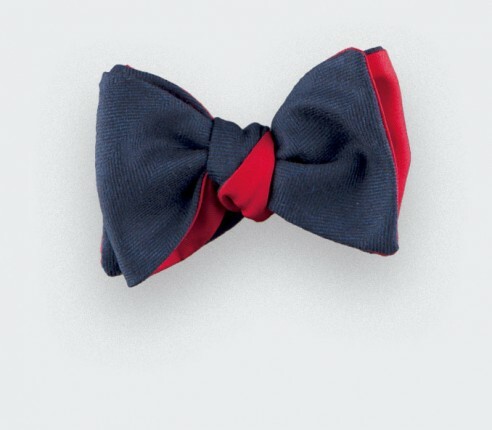 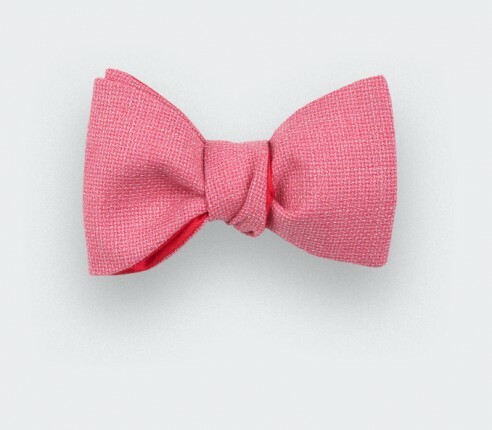 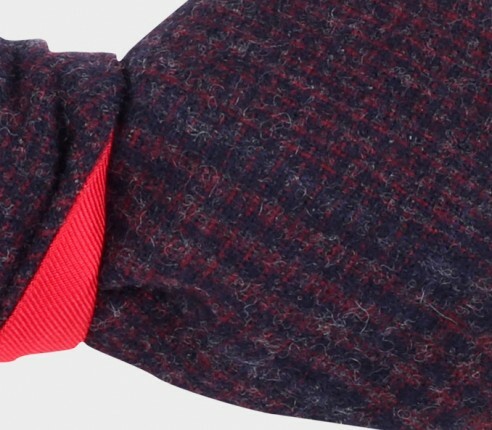 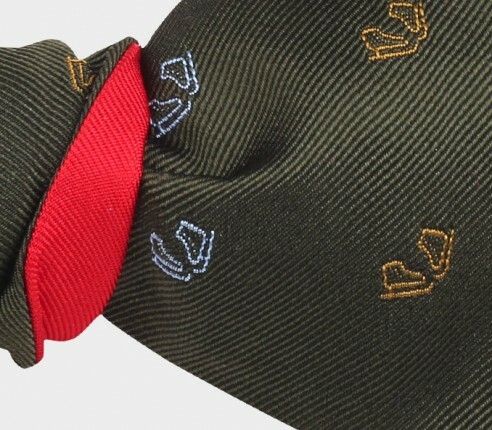 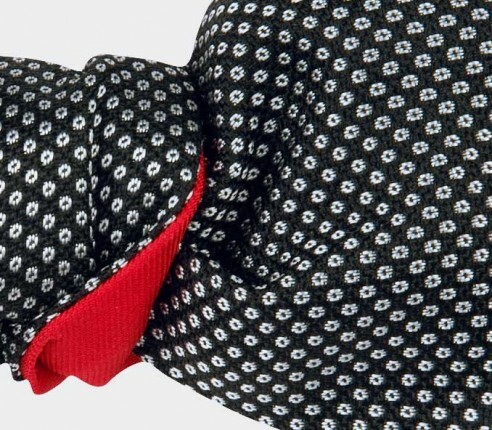 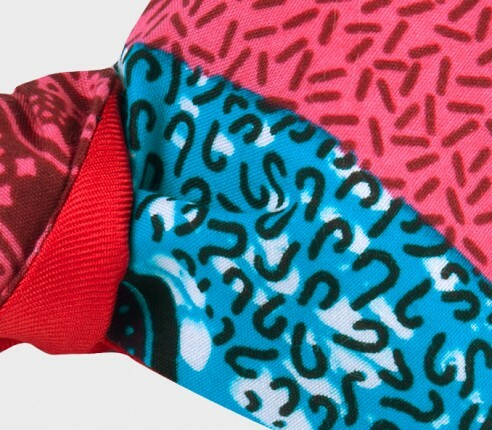 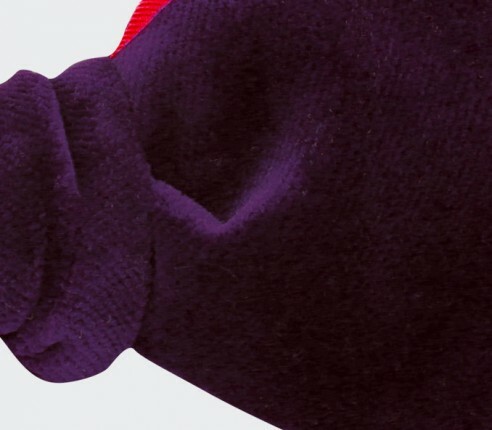 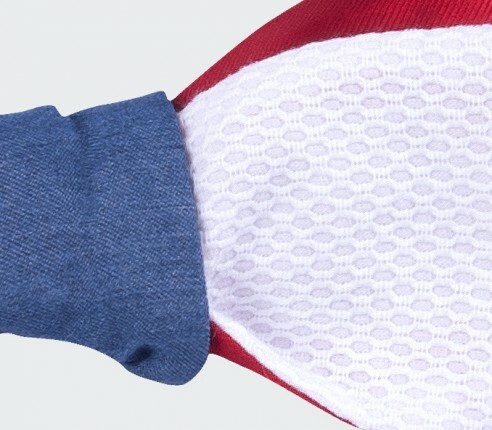 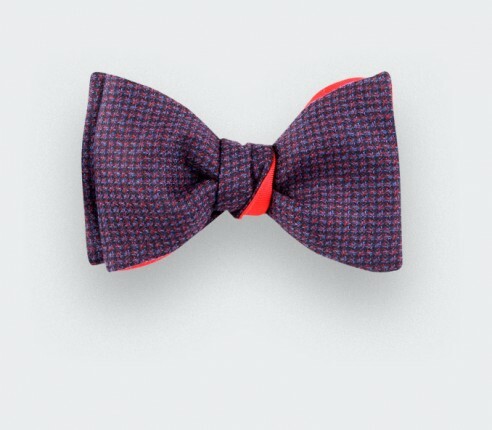 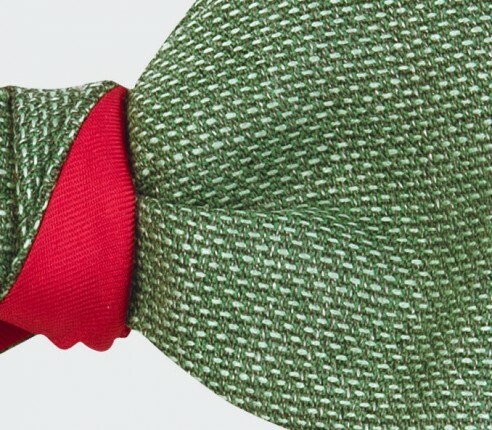 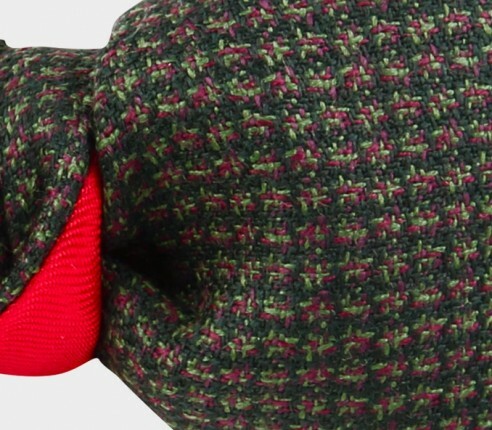 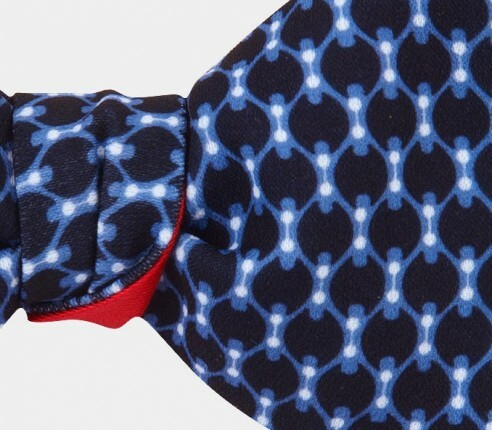 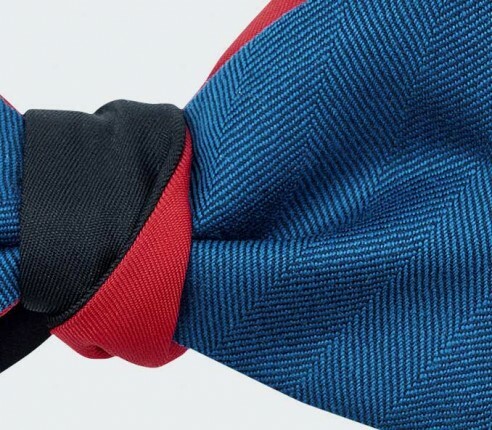 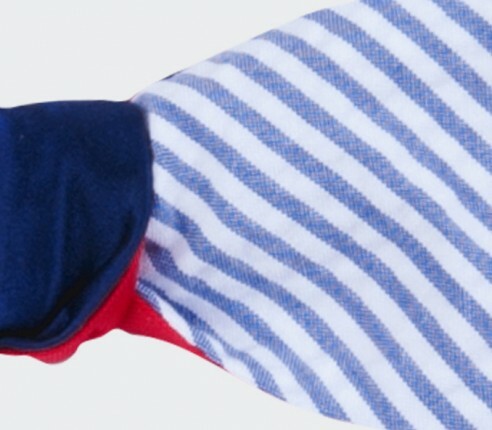 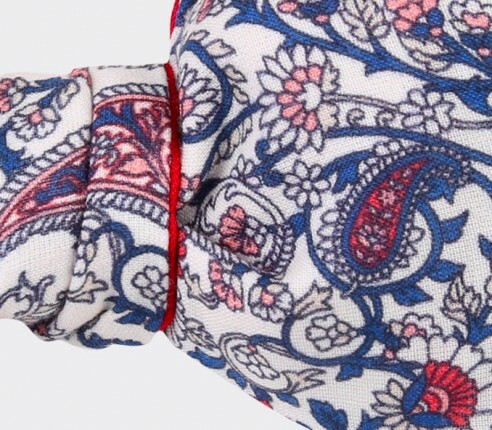 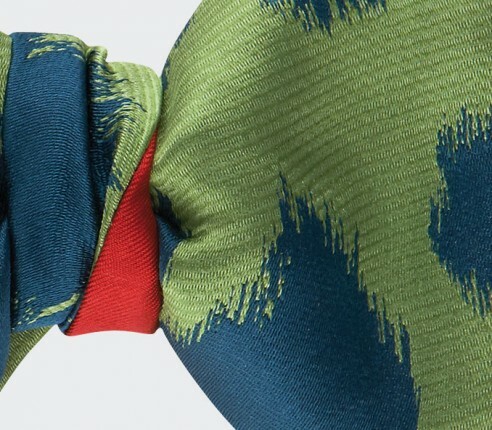 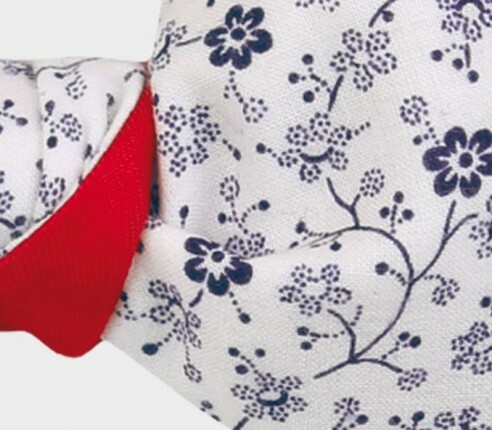 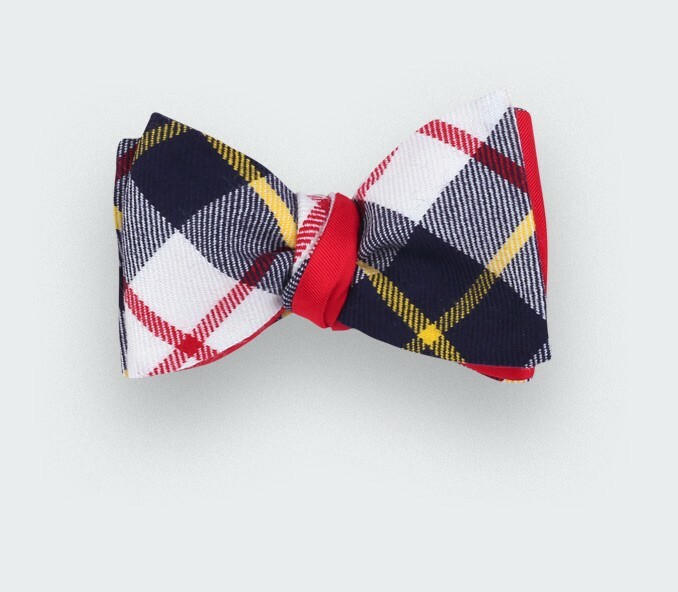 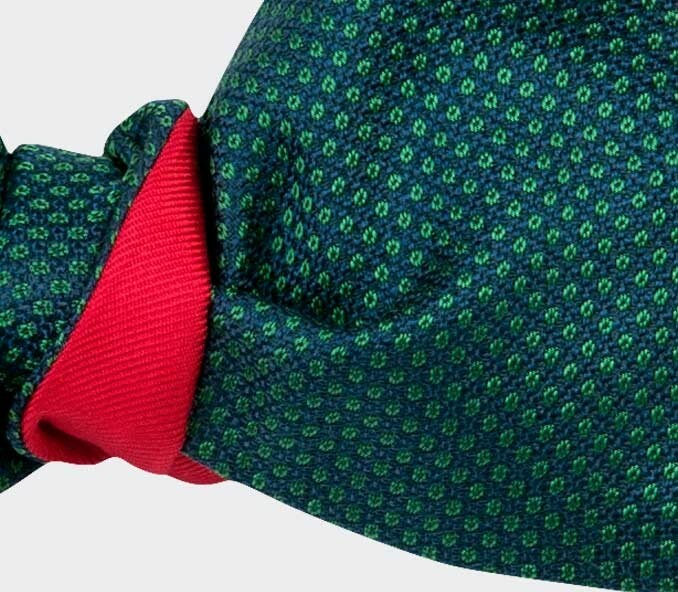 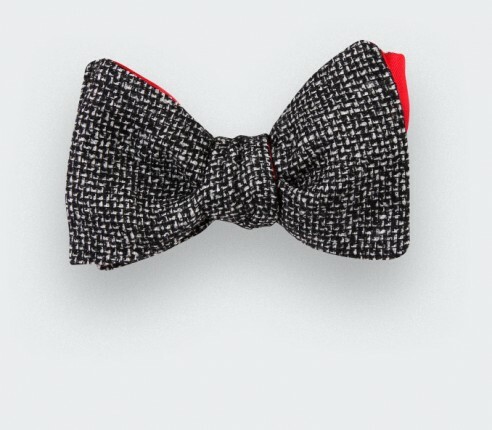 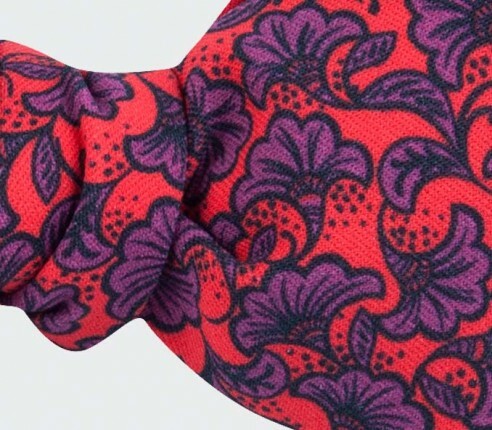 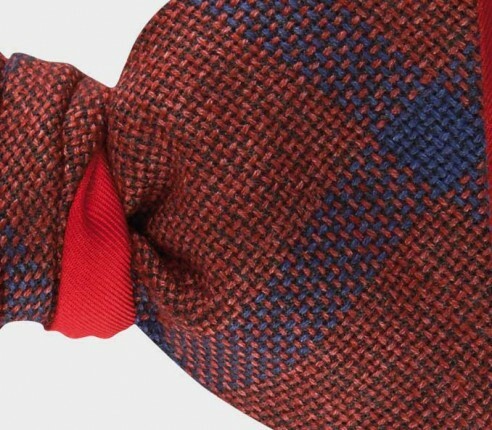 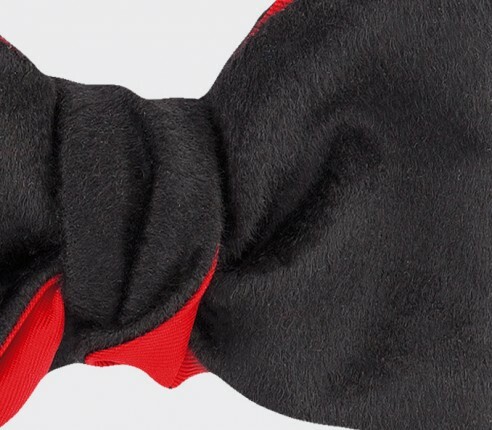 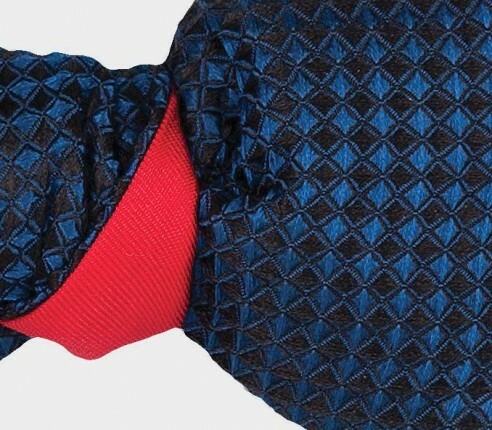 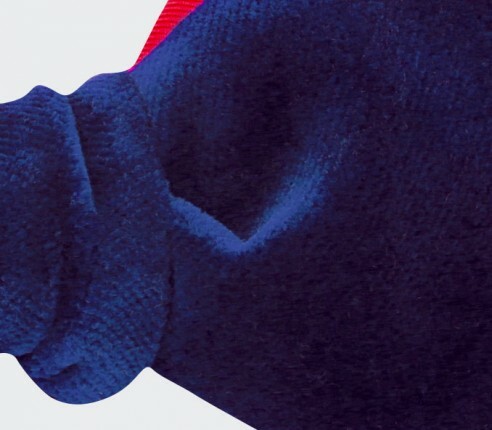 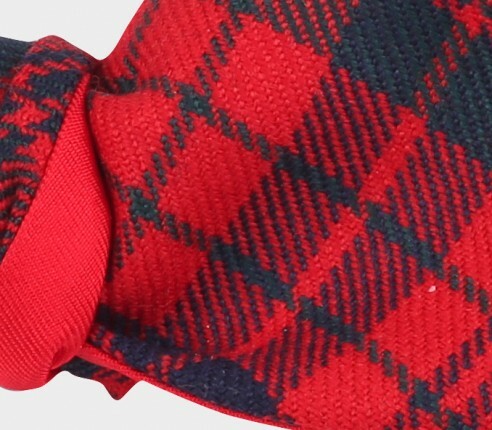 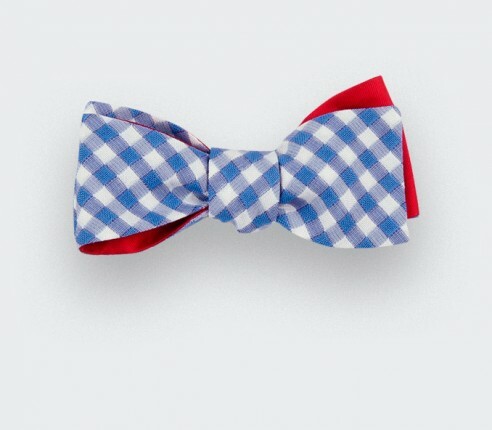 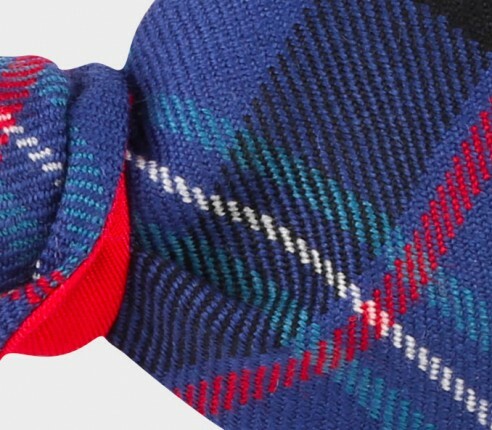 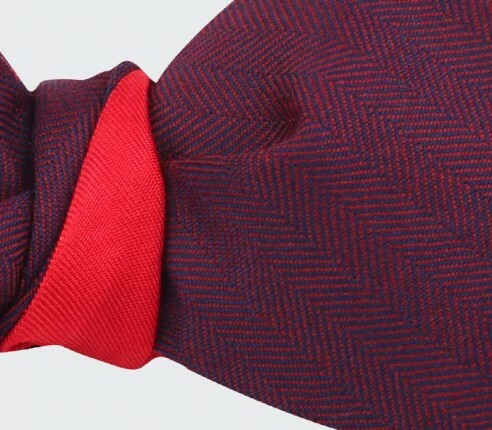 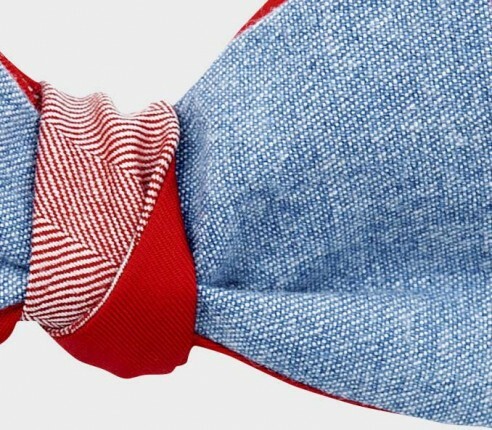 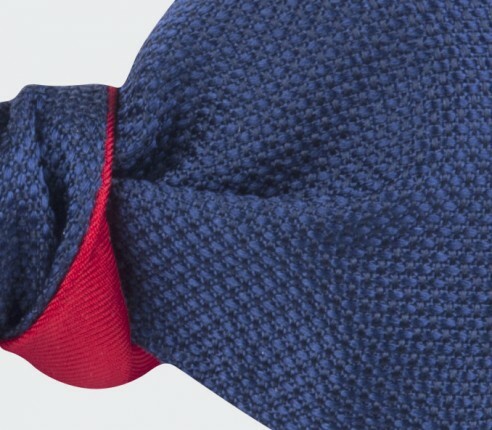 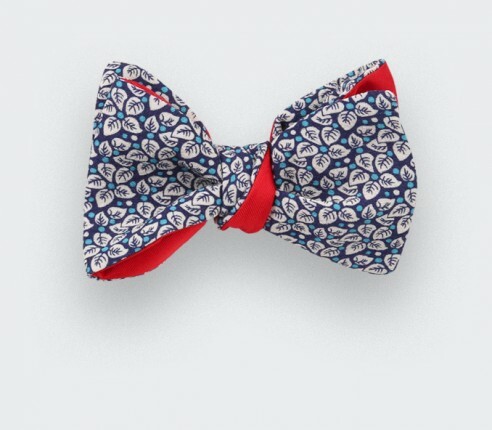 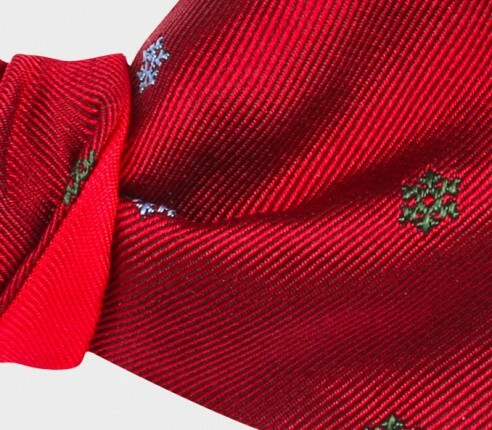 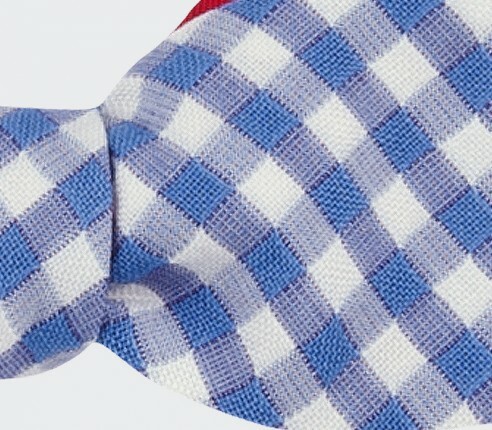 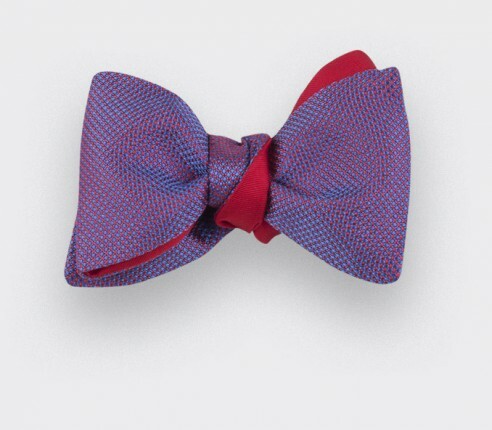 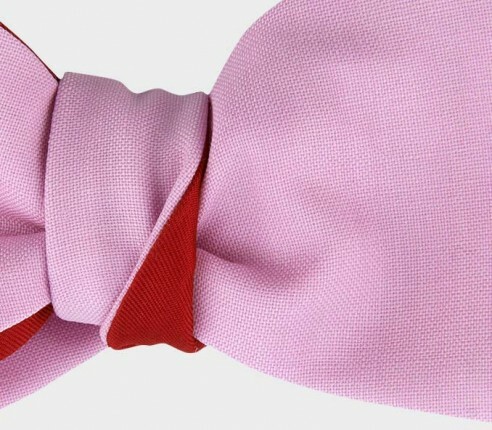 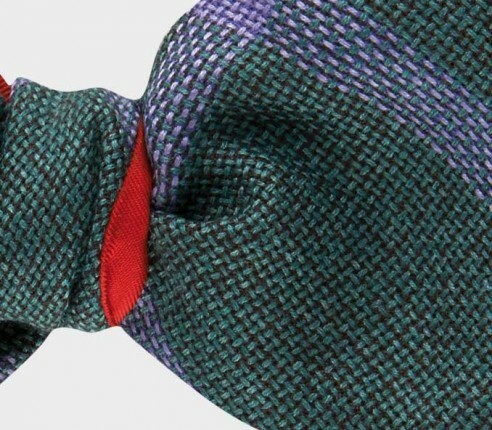 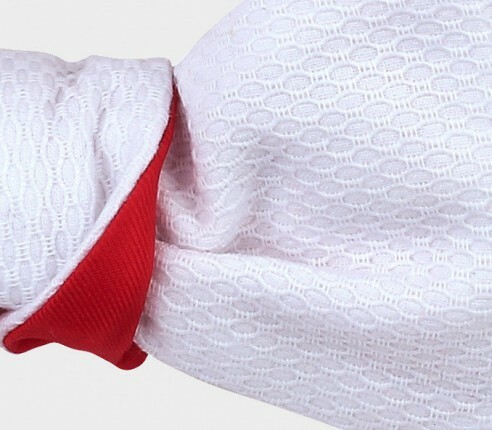 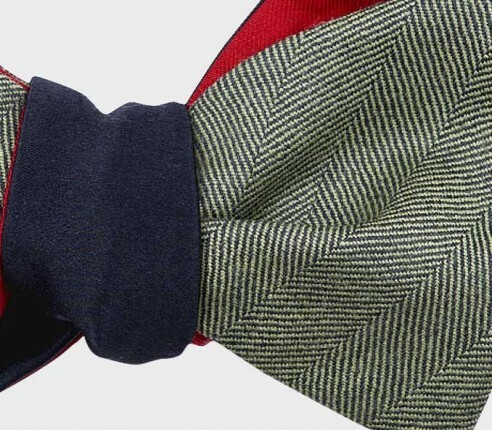 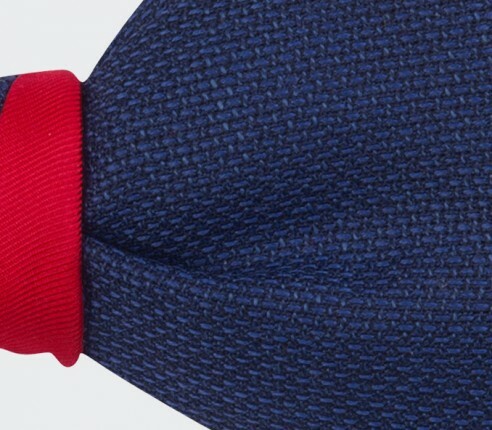 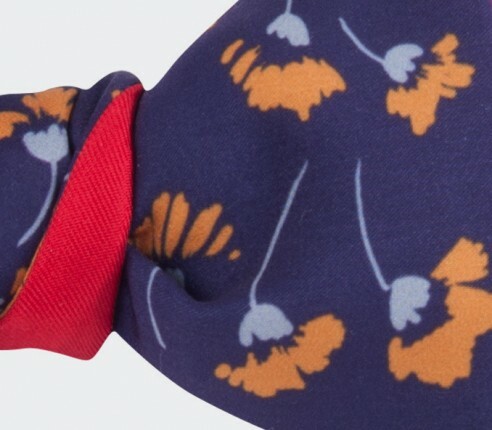 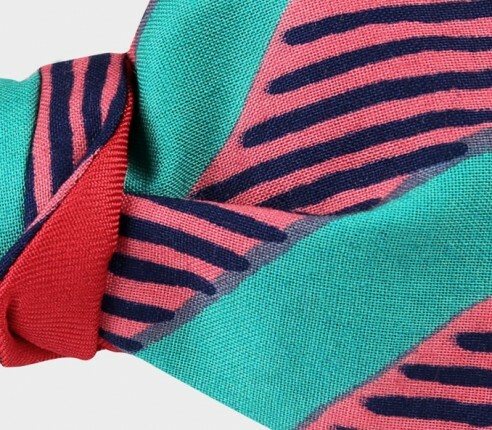 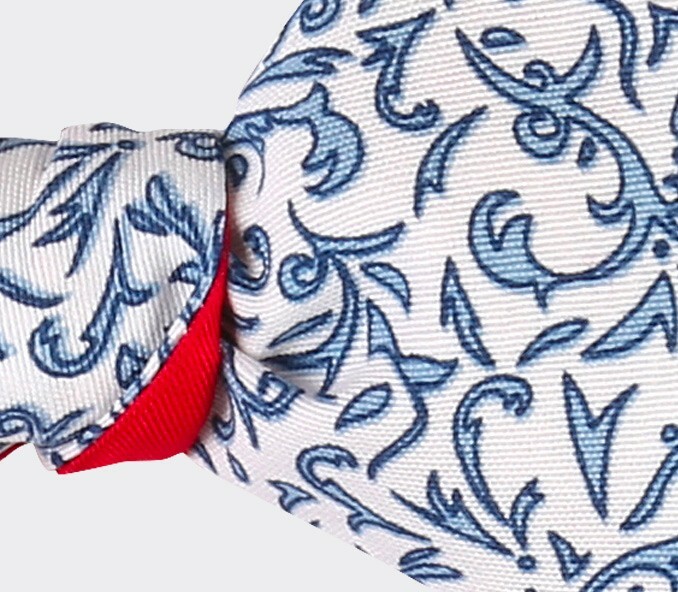 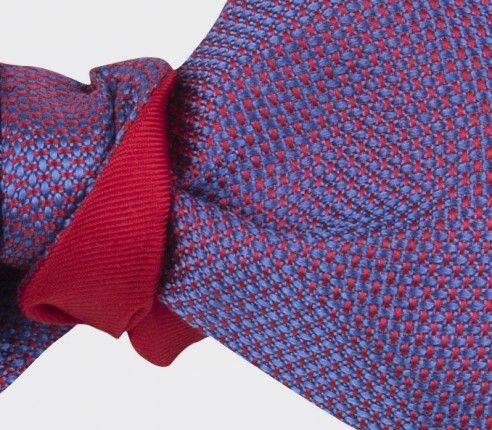 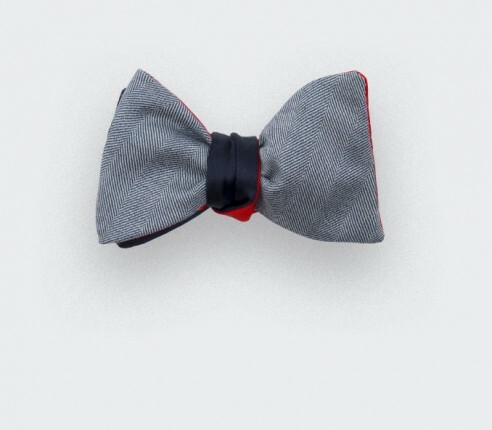 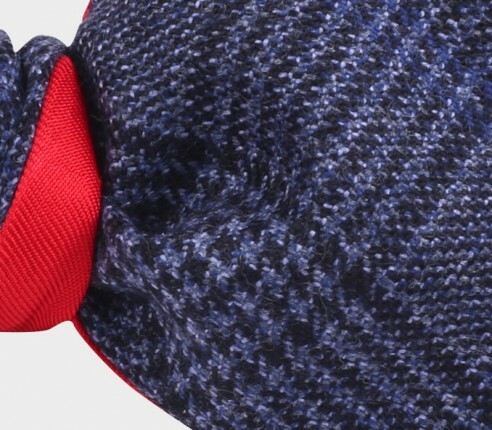 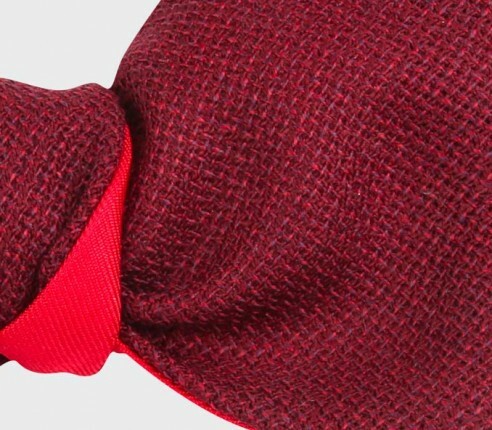 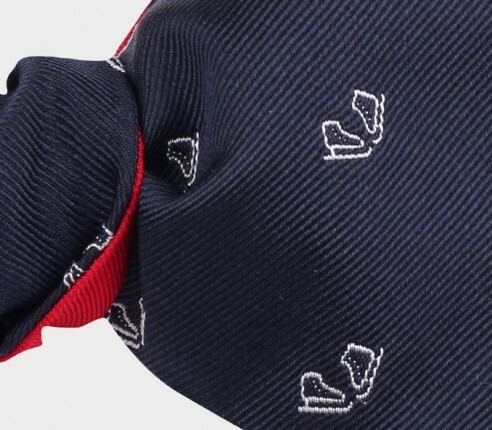 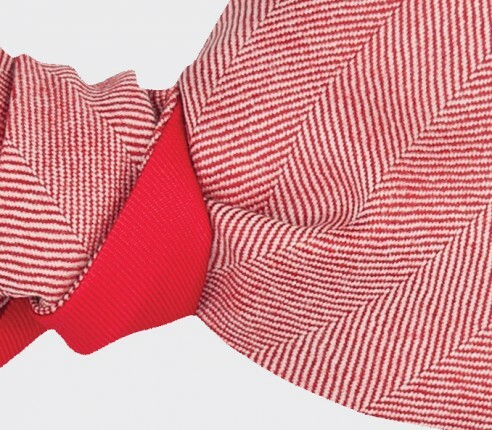 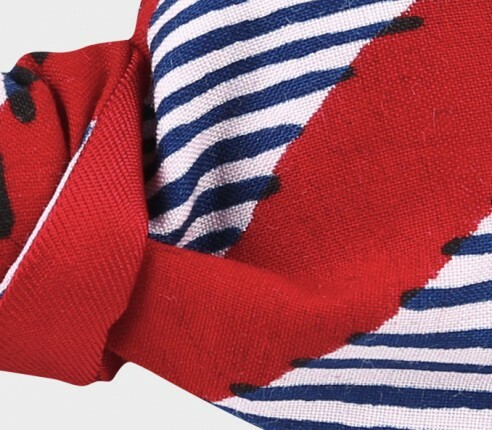 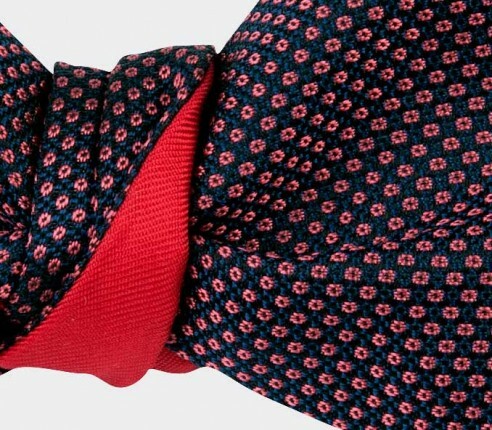 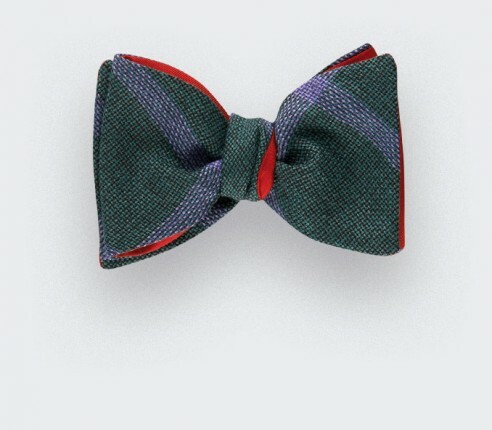 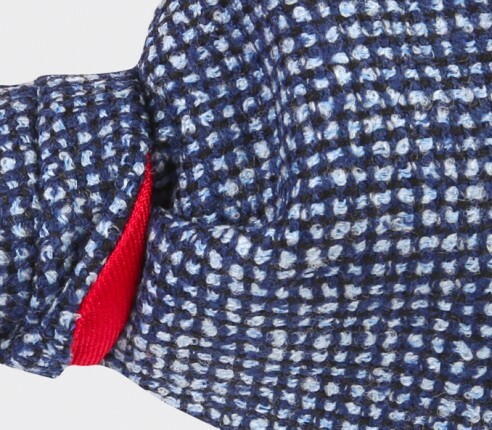 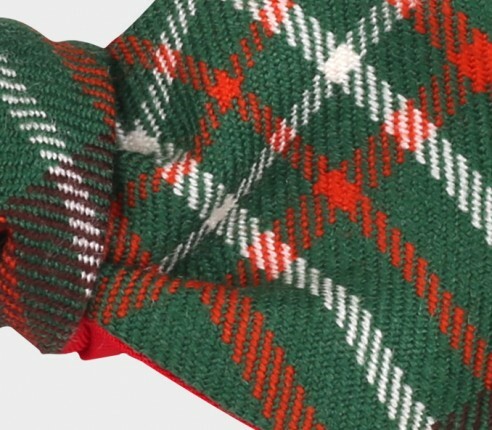 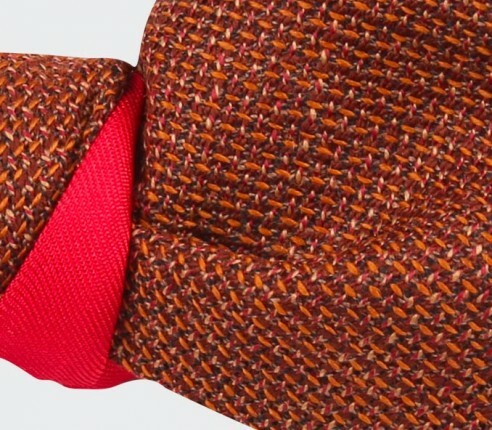 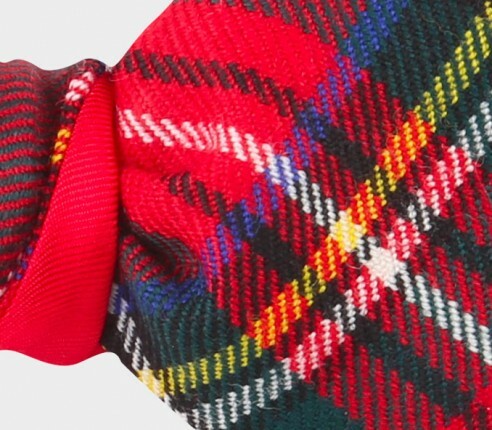 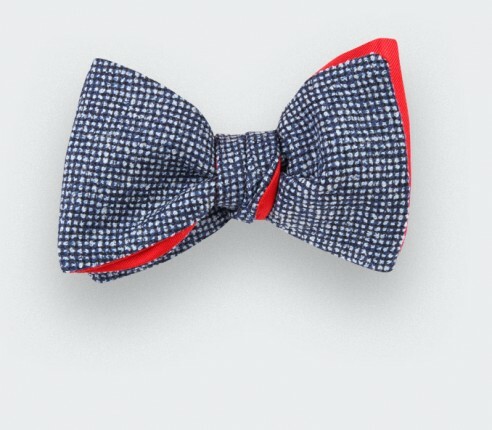 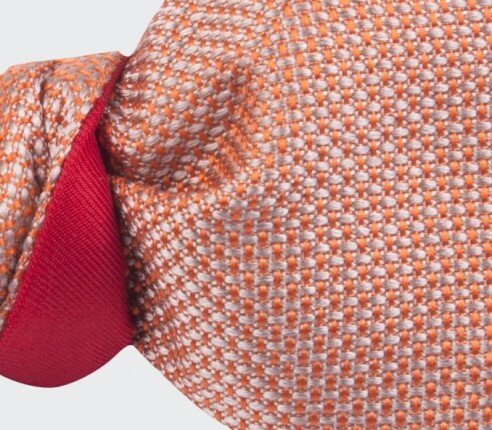 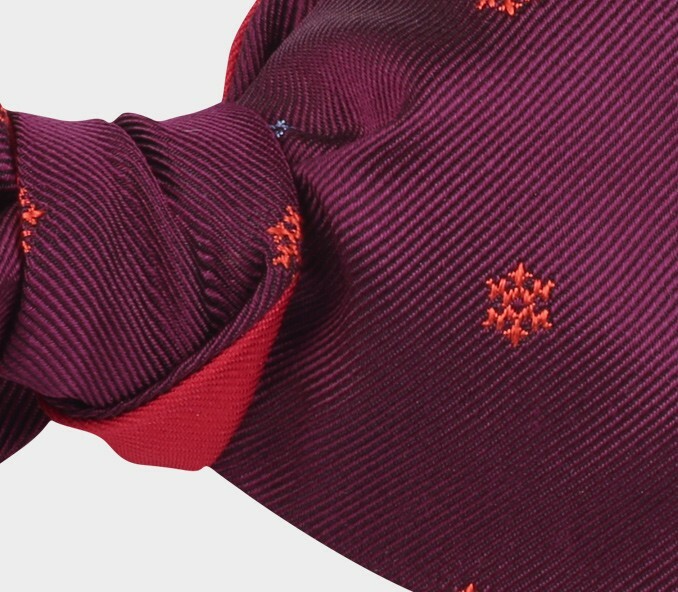 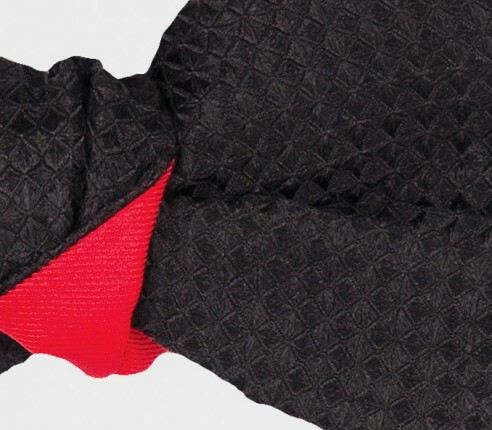 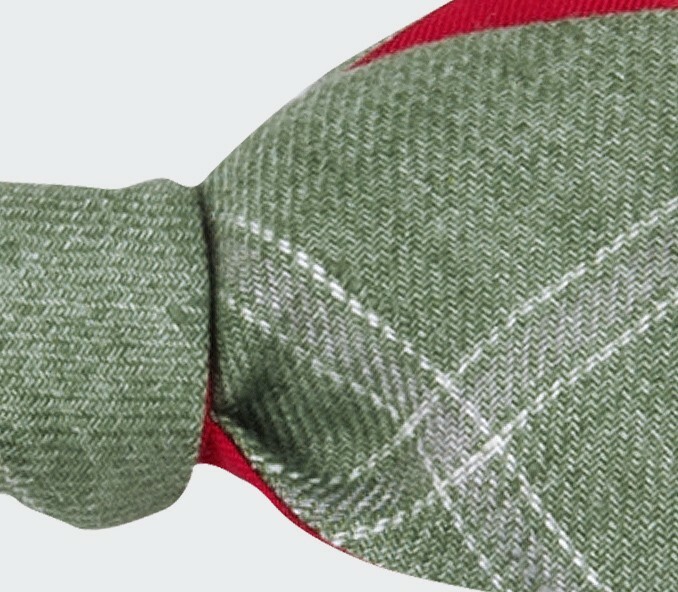 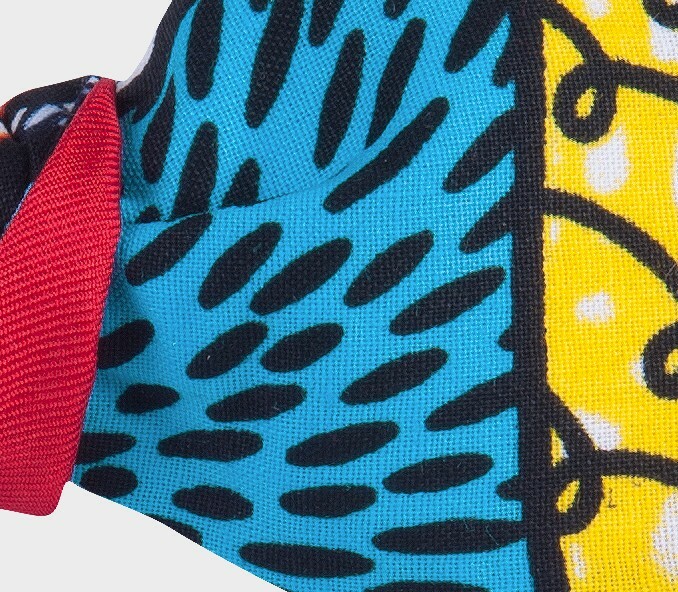 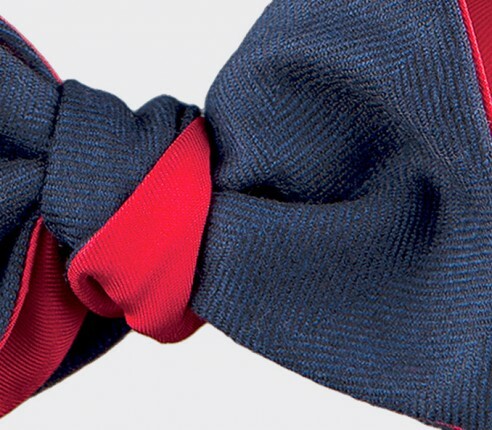 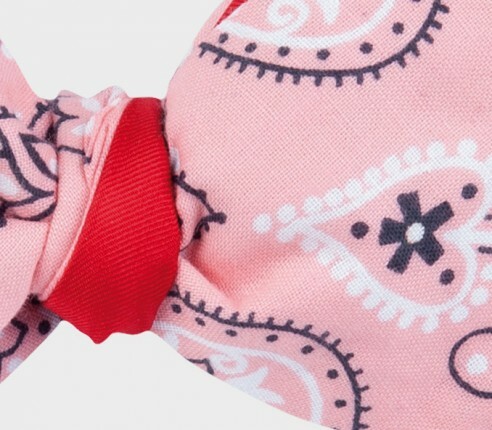 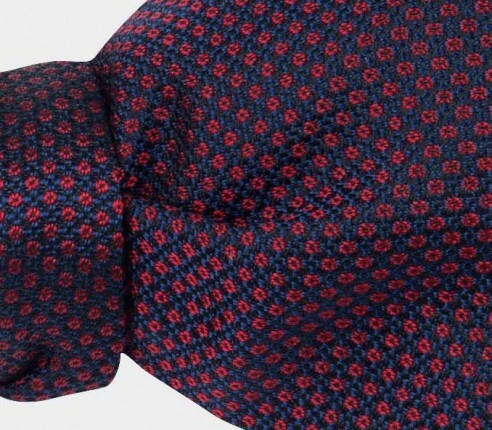 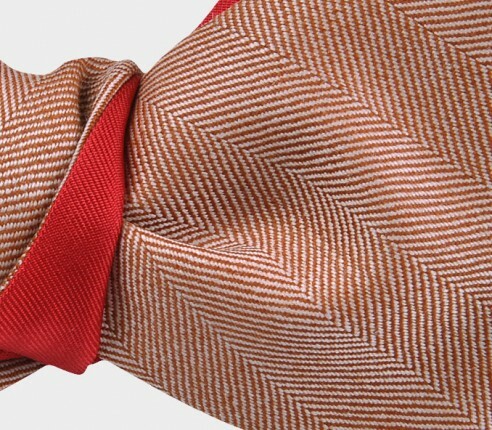 The bow ties have classic colours and patterns but are made with a seersucker fabric which gives an interesting texture. 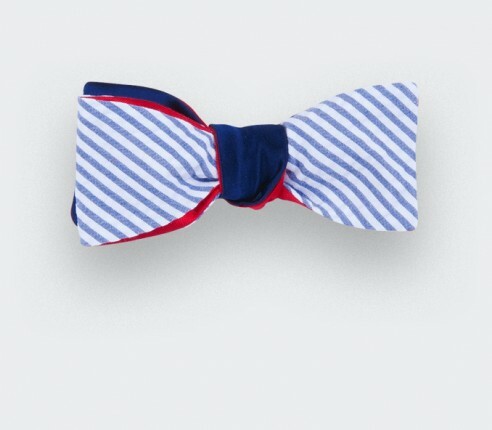 Bow ties for the mid seasons. 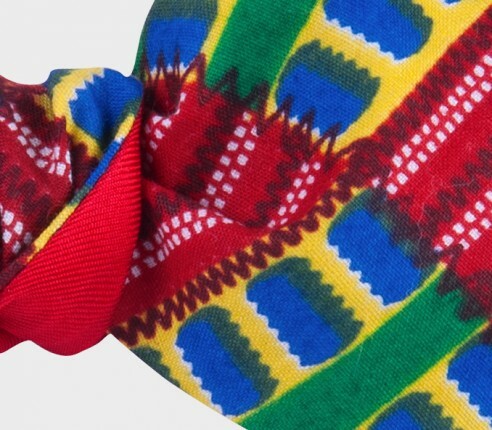 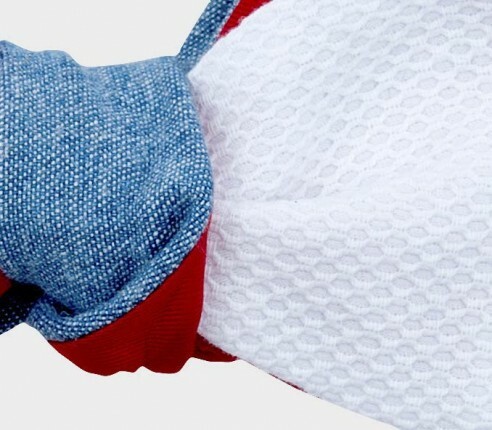 It is made of delicate wool and silk with large and colourful squares patterns. 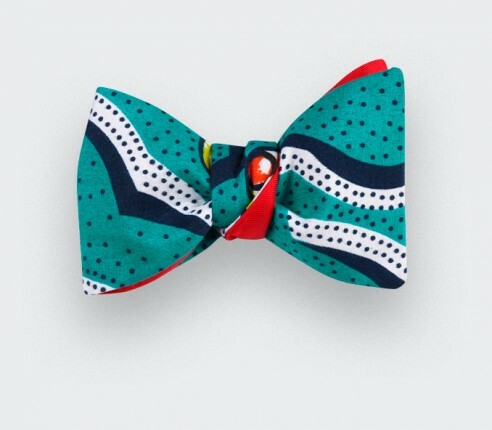 Bow ties made of vintage fabrics coming from Haute Couture collections, antiques and vintage clothing. 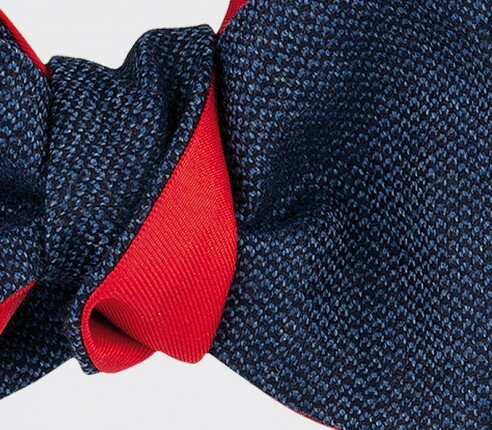 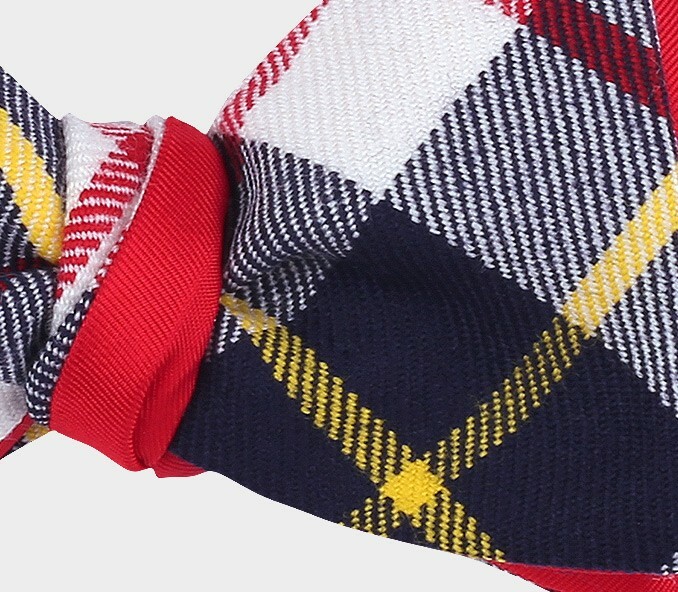 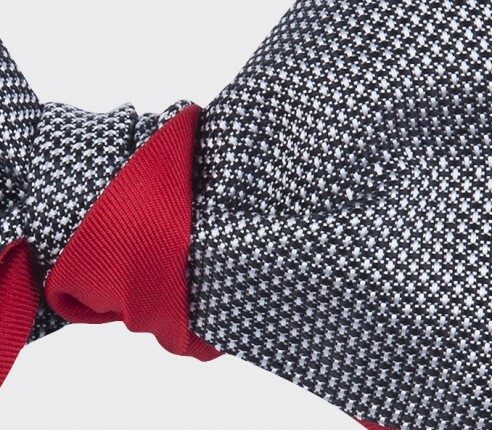 Discover our winter sportsbow ties collection, made of silk with winter pattern, designed by Cinabre. 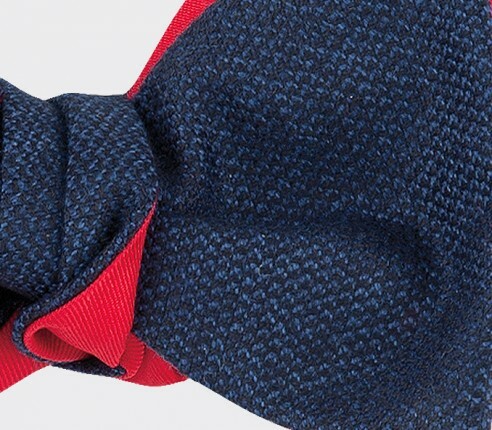 Discover our slim bow ties which are narrower and slightly more elongated compared to the Cinabre classic shape. 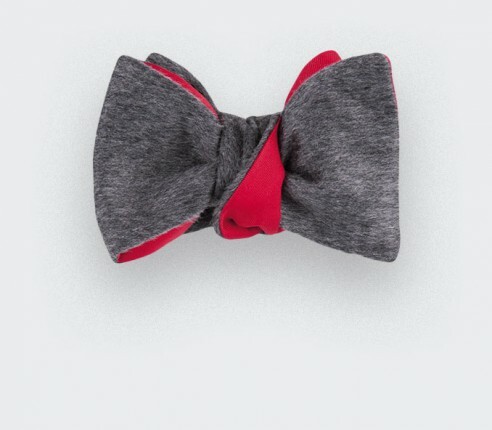 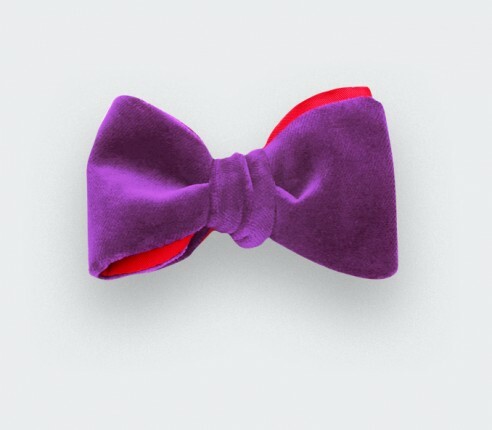 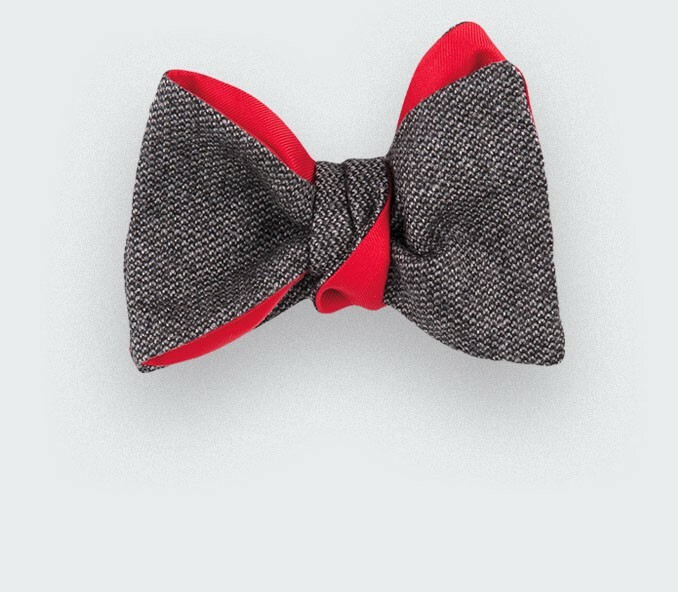 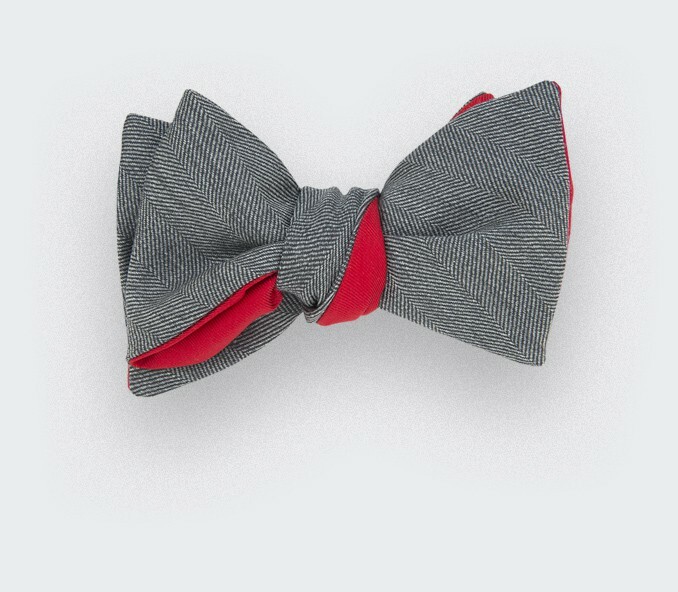 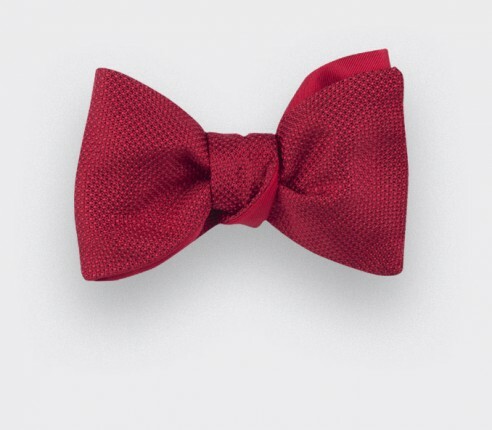 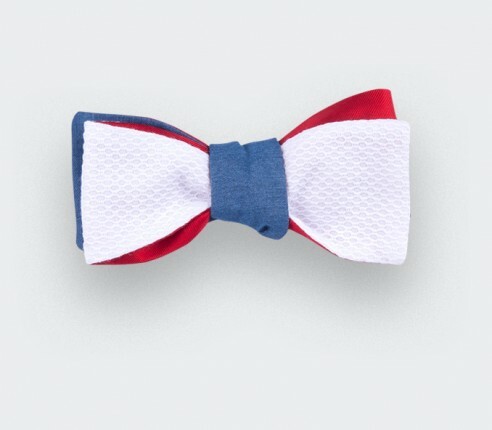 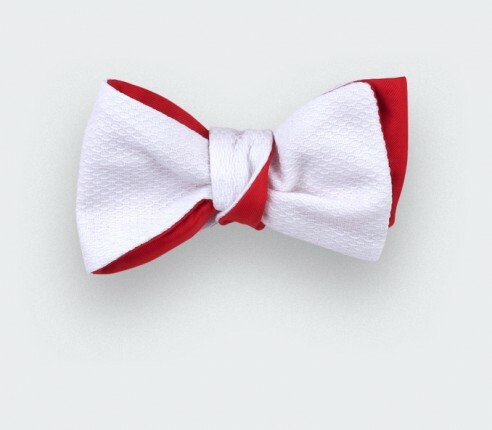 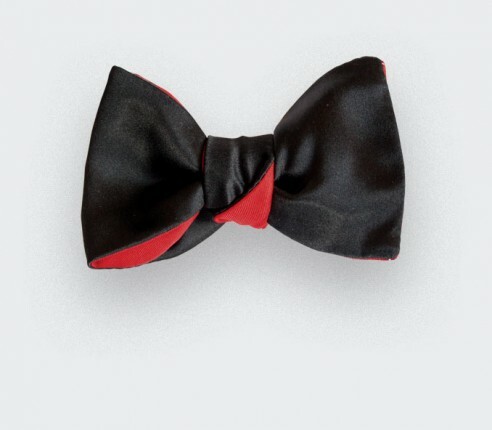 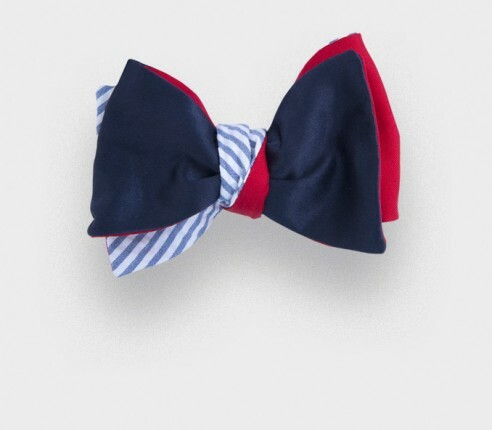 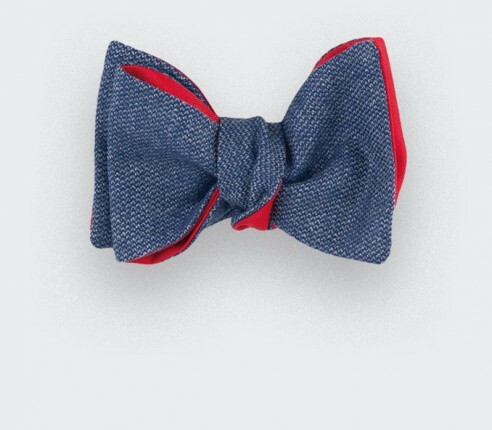 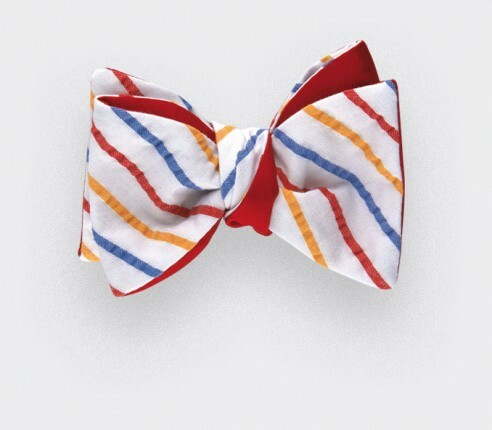 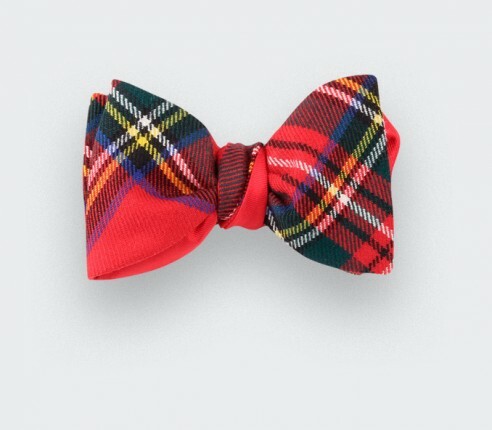 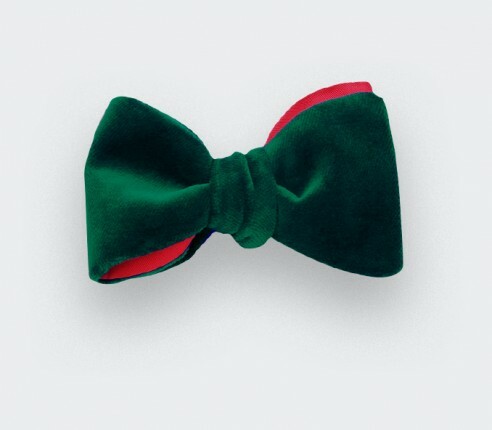 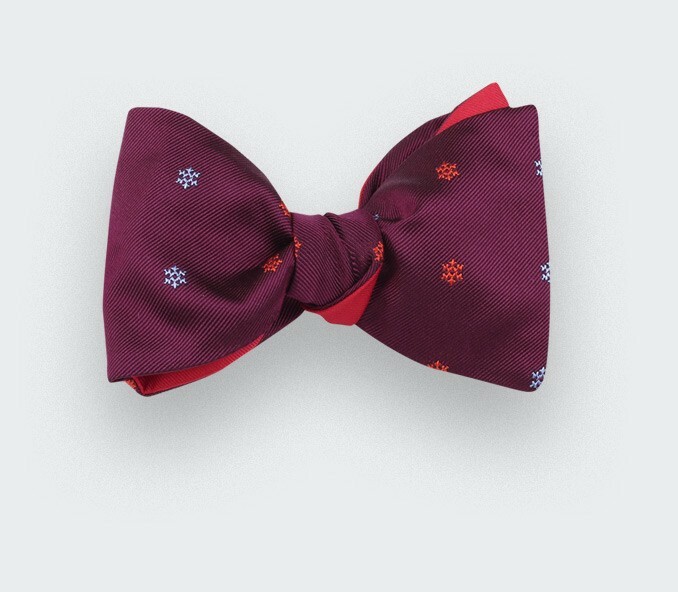 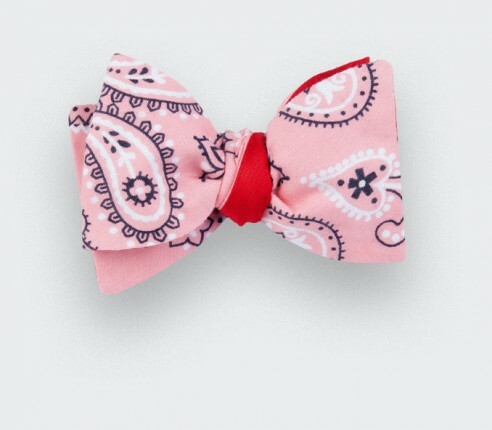 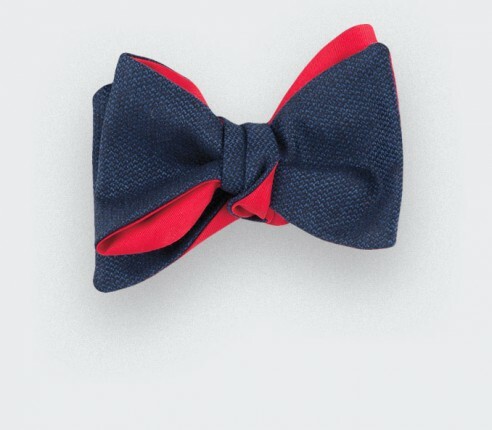 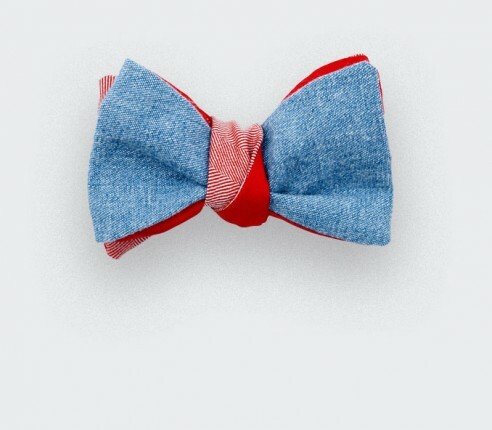 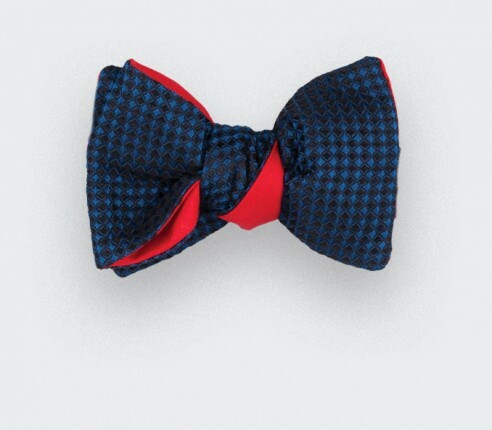 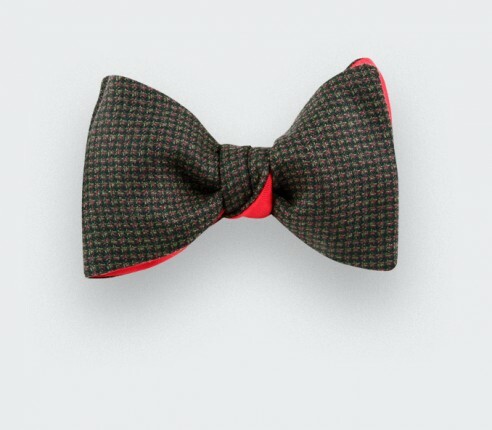 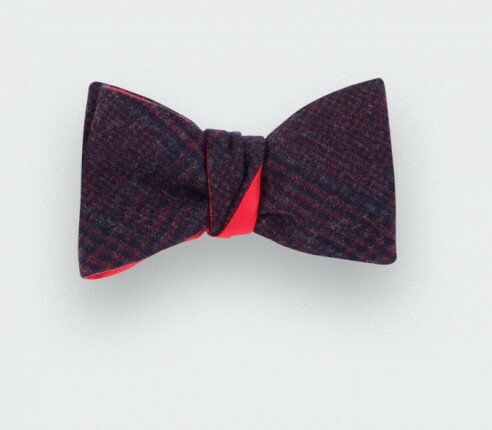 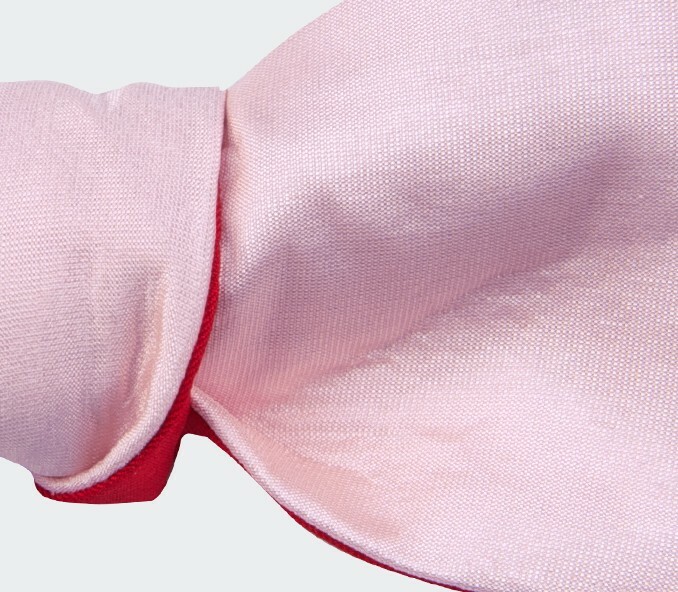 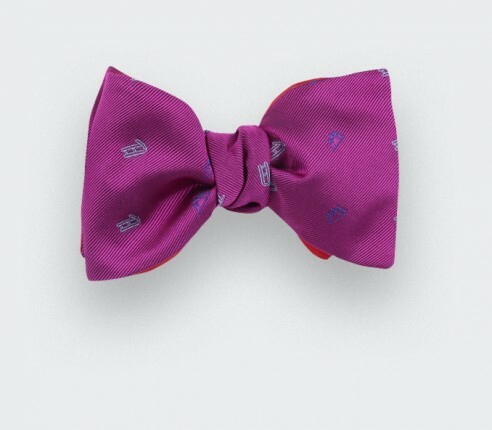 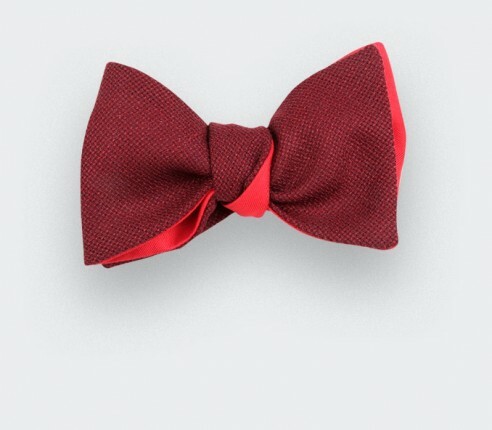 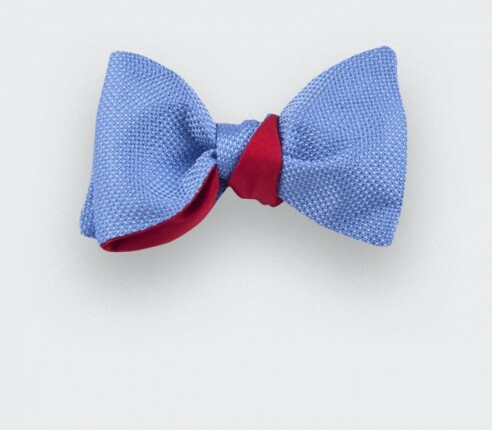 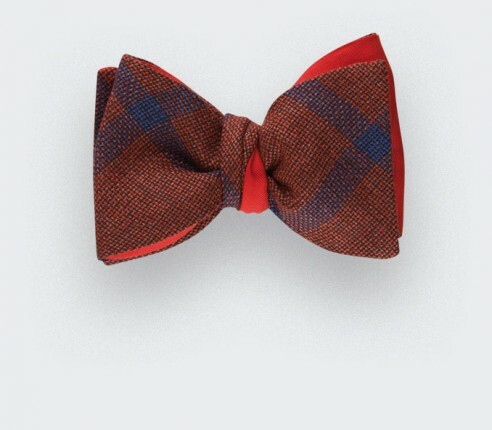 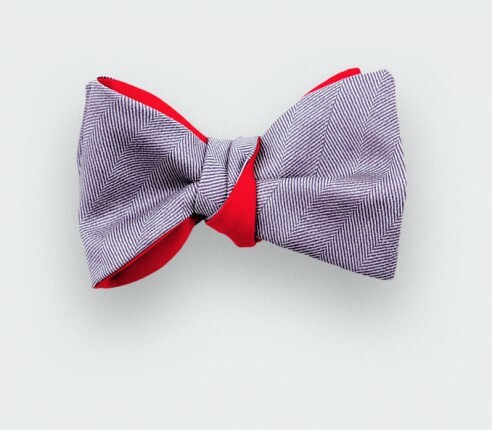 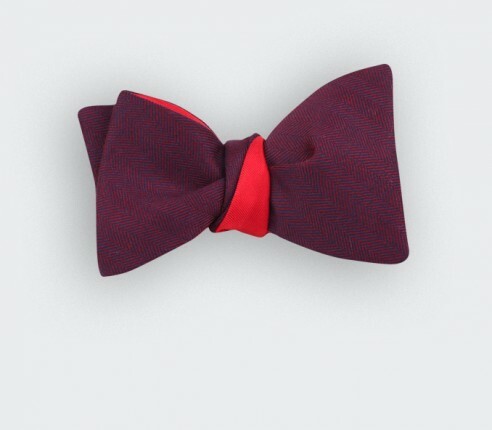 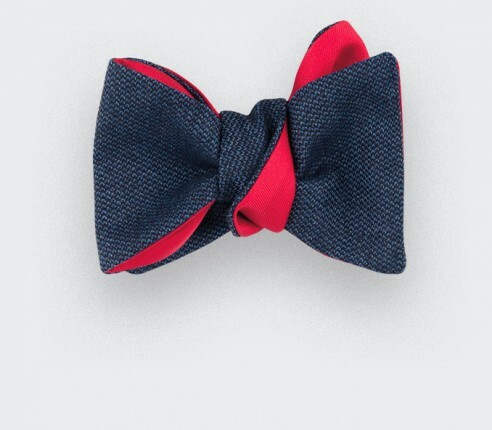 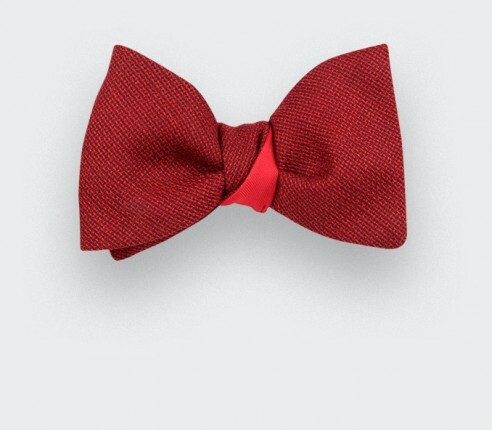 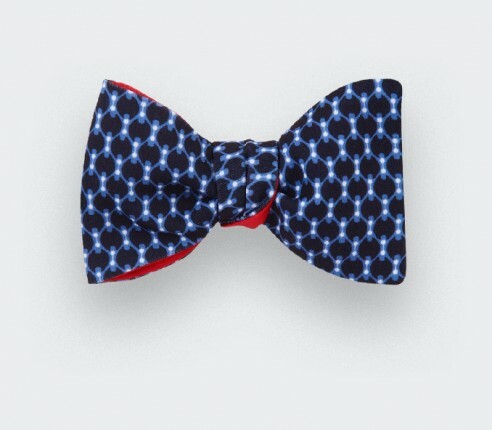 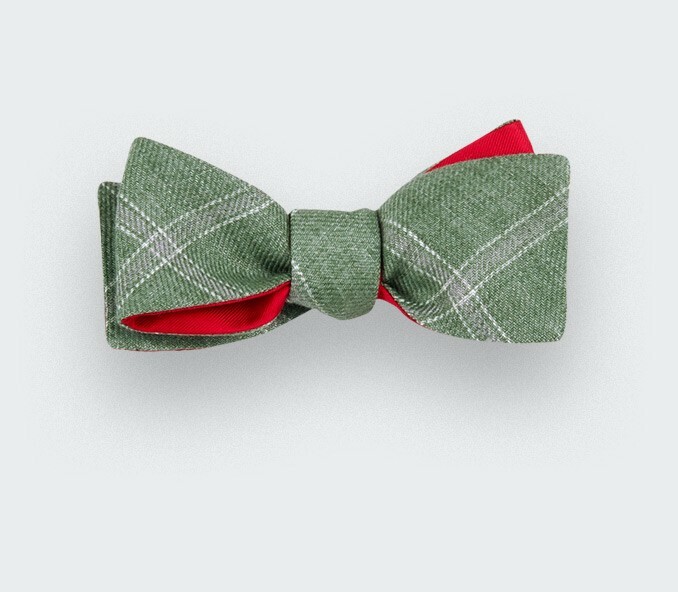 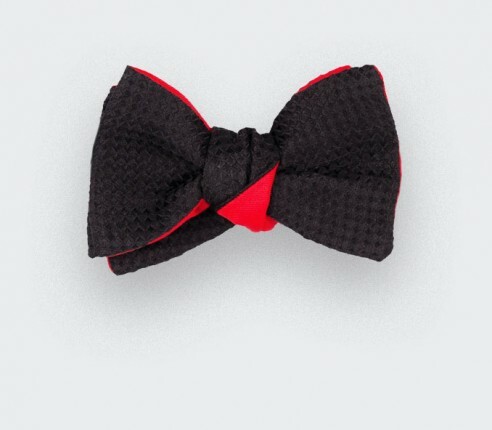 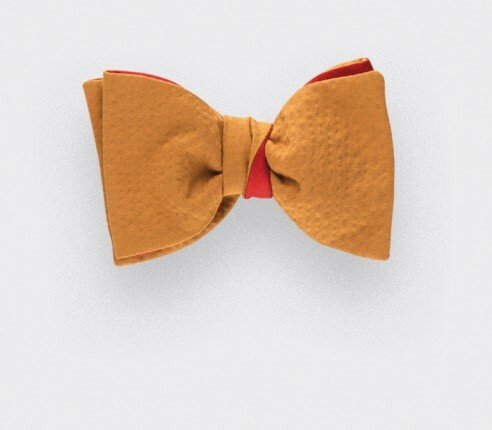 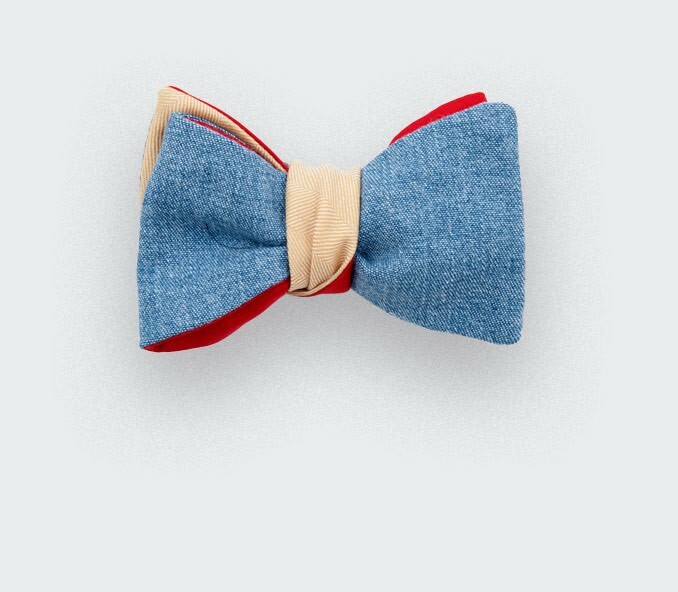 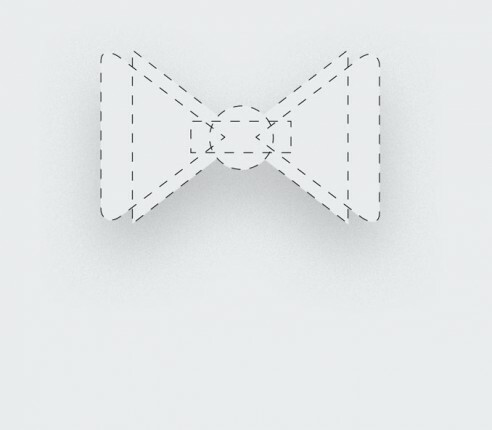 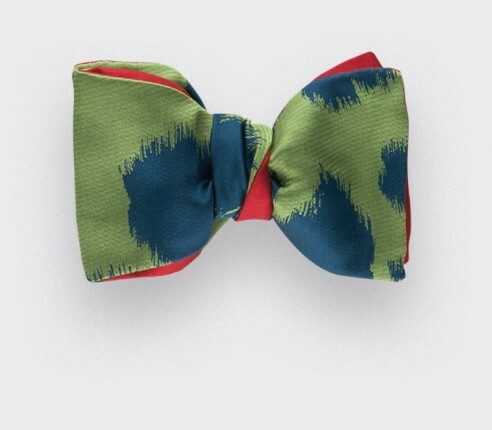 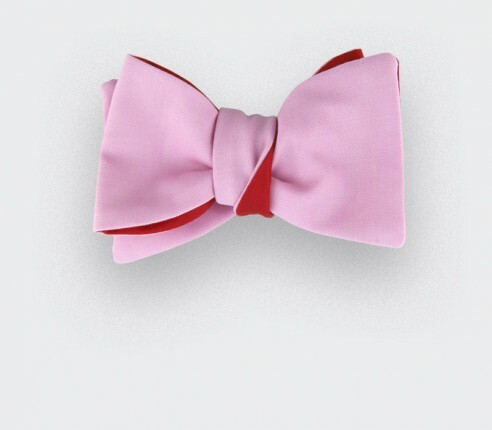 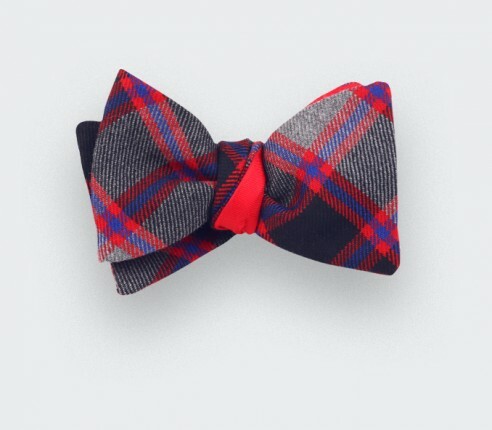 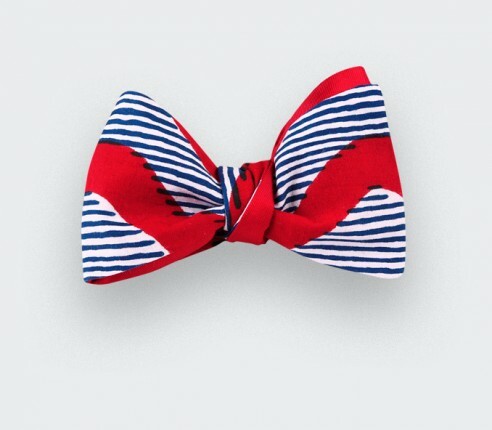 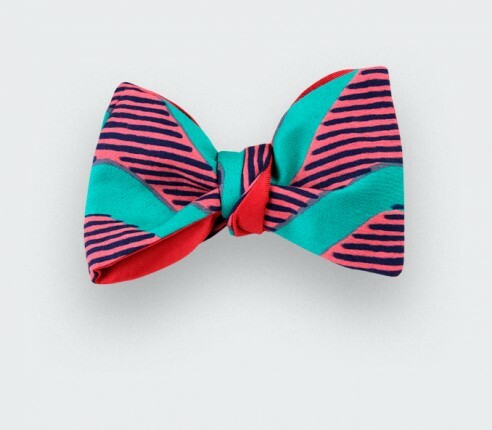 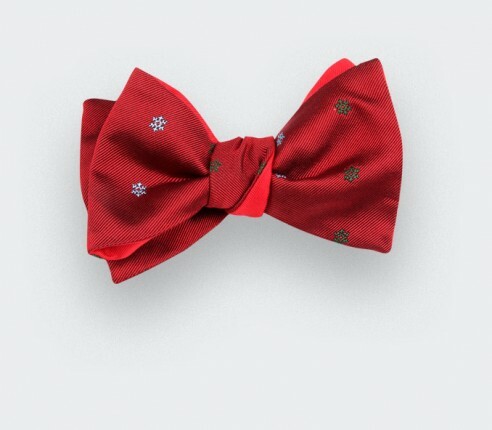 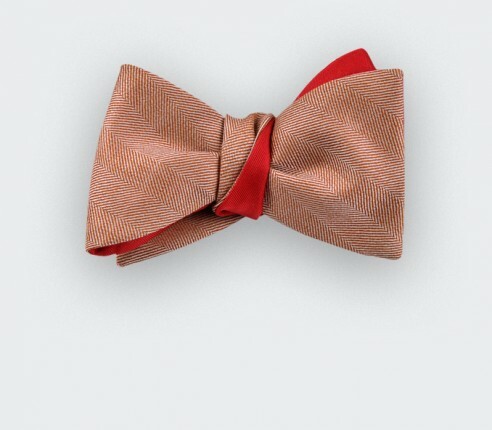 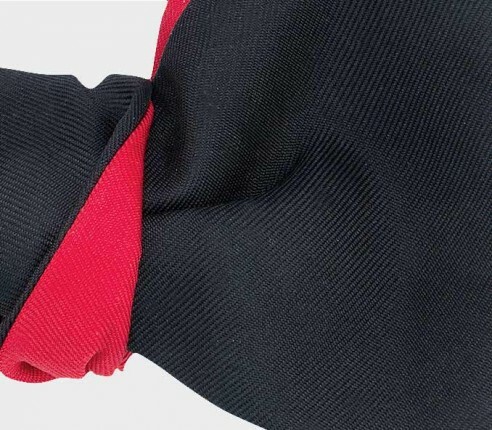 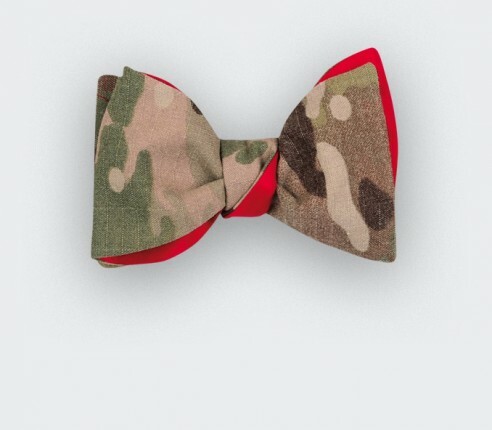 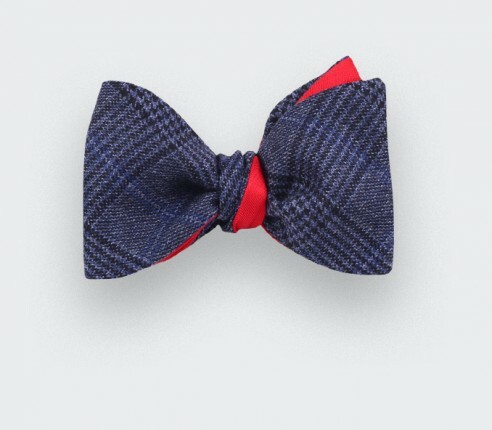 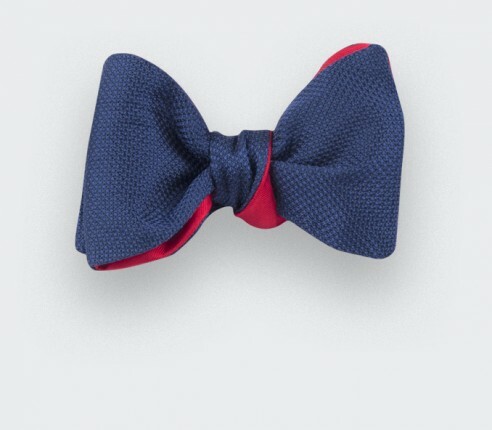 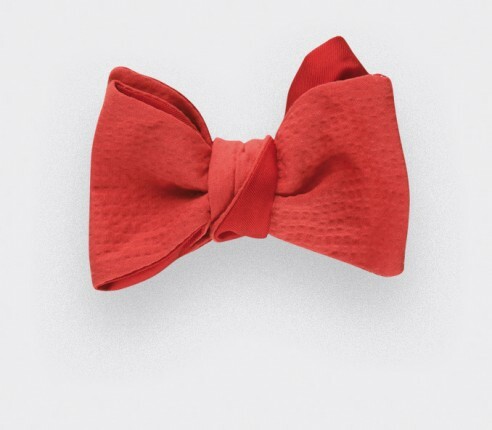 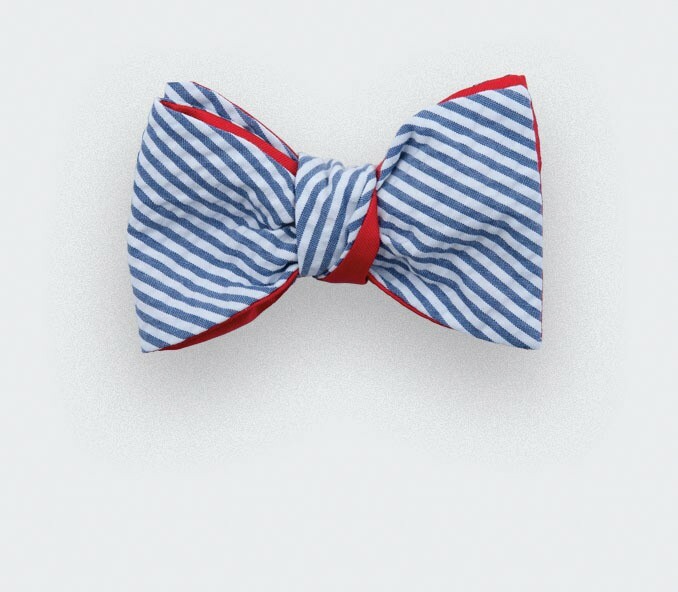 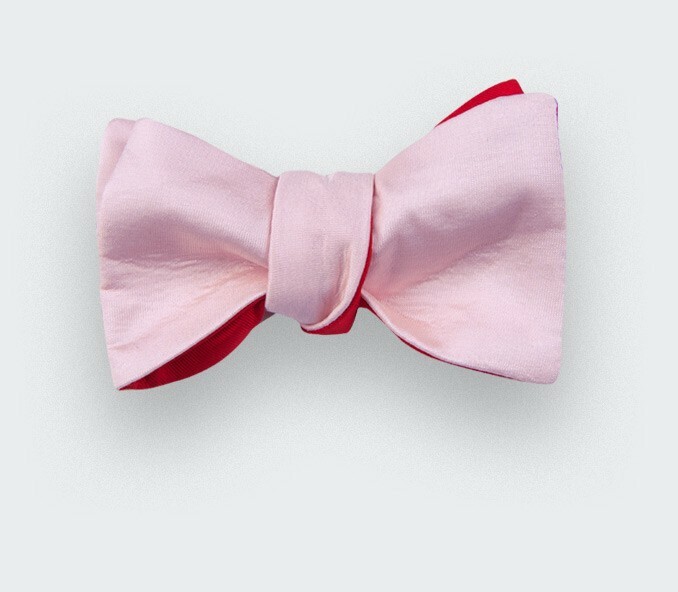 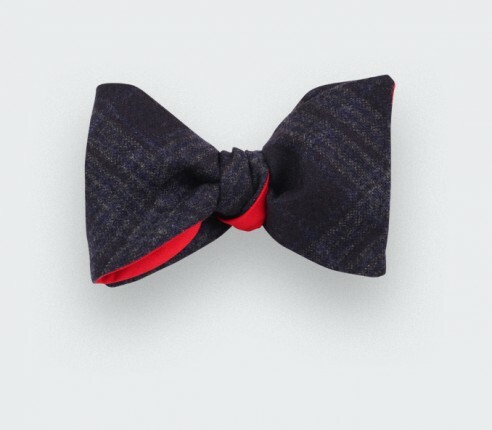 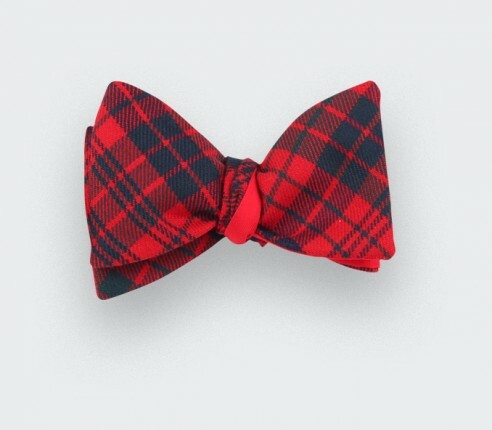 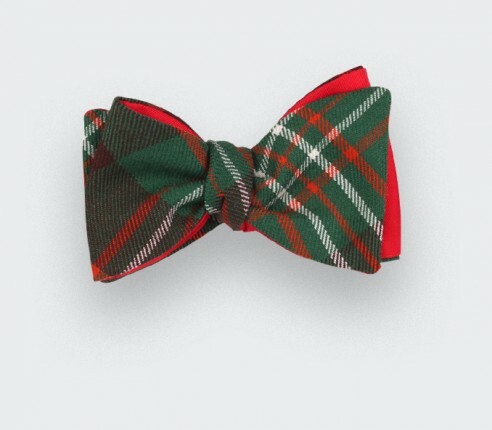 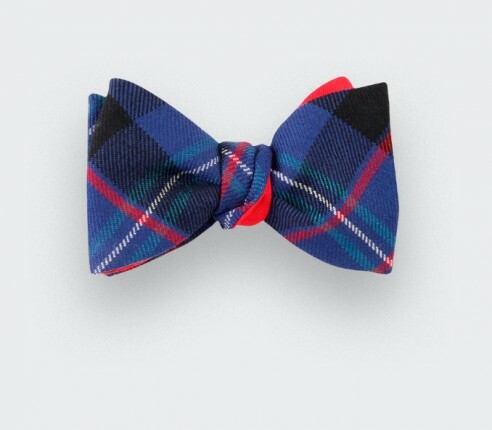 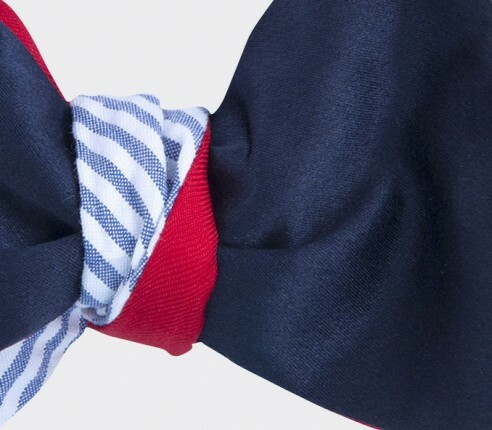 Create a unique bow tie from a wide selection of colors, materials and shapes. 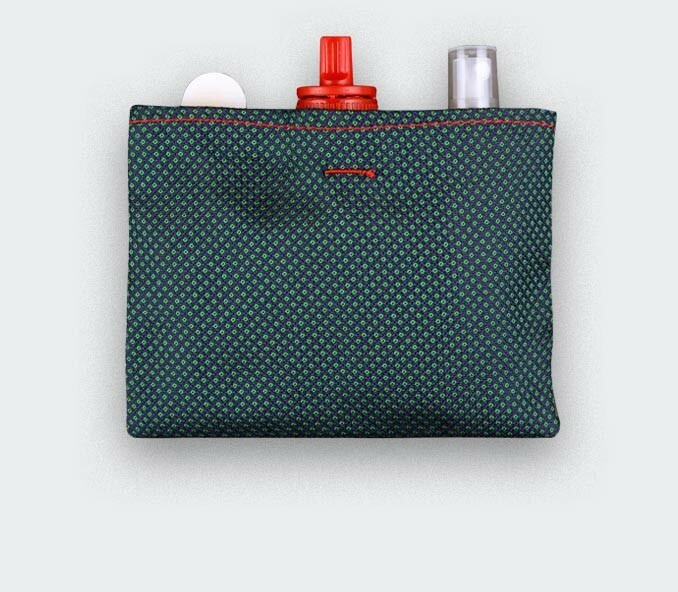 We designed a survival kit for the groom, very useful during his wedding day.